I have done a german sprachkurz many, many years ago, and so sorry aber Ich habe alles fergessen. 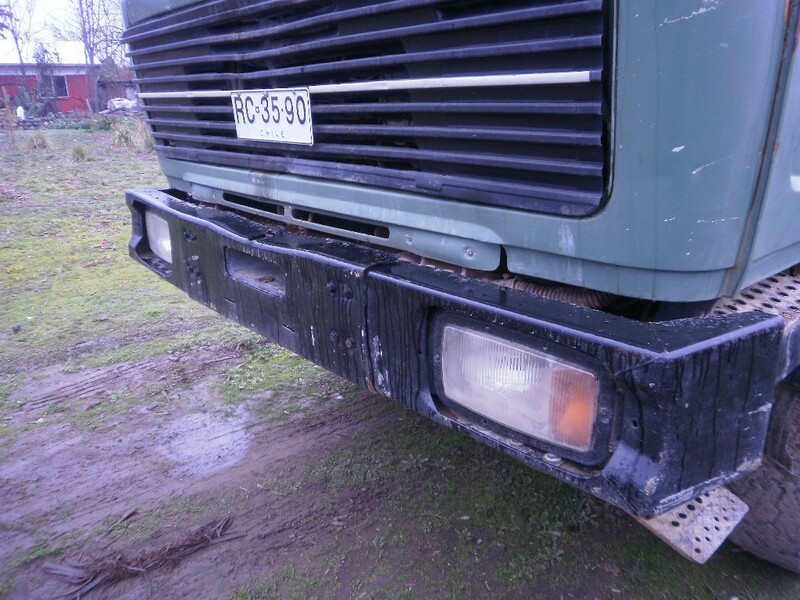 I have got a 1988 Mercedes 2626 AK 6x6 for my all terrain motorhome. 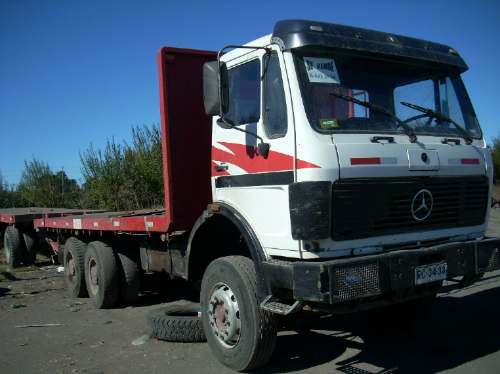 Unfortunately there are no manuals for this truck in Chile and no available manuals on-line in the internet, neither manuals available from Mercedes Benz or its representatives. 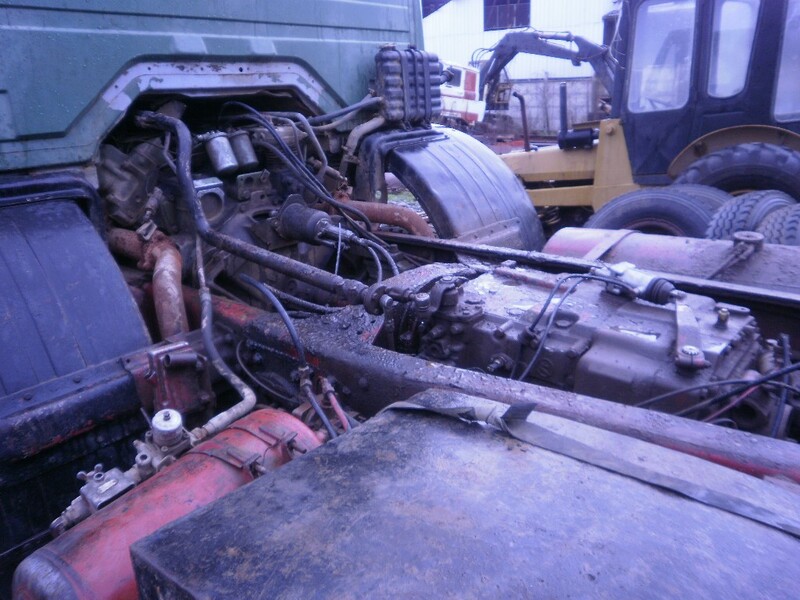 The truck was badly treated and needs a complete overhauling, which I am doing with enthousiasm, but I need the pieces numbers, torque measurements and so on. If someone has or knows where the manuals can be, it would be extraordinarily appreciated. the documentation which are you looking for,is not longer in hard copy available. The best solution is,to contact the Mercedes dealer in Chile. He can support you with all necessary informations. Thanks a lot but I have already tried with the site you posted and id did not worked out. 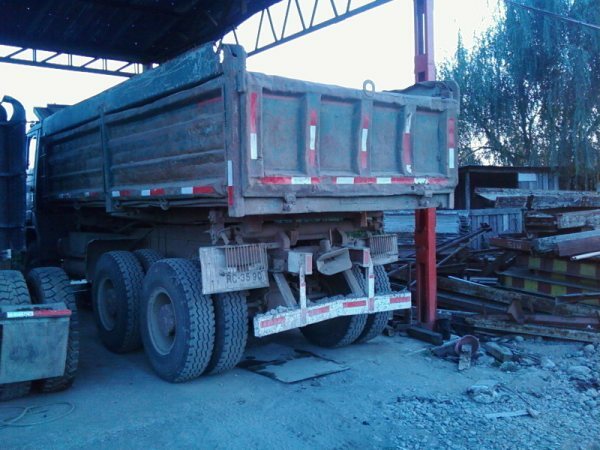 The chief of the Pieces and Parts department of Kaufmann in Santiago supported himself with information got from the argentinian armed forces because he has no manuals for these trucks himself, and this was years ago. He has at this time no way to help me with information on my truck. 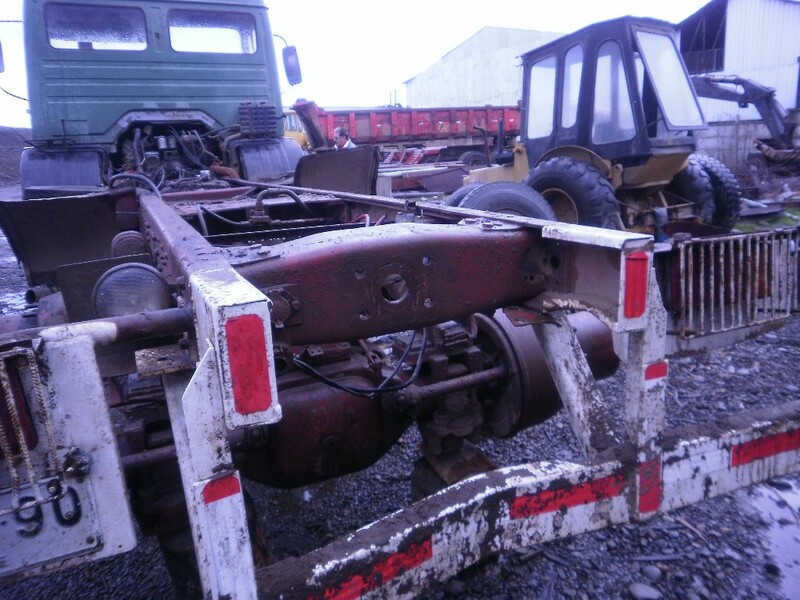 I have bought a second truck for pieces, an 2226 6x2, and hopefully will need only a few parts to make all work, but I am still going to need the manuals. there is no problem to get spare parts numbers from EPC(electronic parts catalog). But the workshop manuals are not longer available. Here is one web site,get in contact with them,they are printing the documentation for Mercedes.Maybe there is a solution. Buchundbild has not the manuals. I have got the EPC for Mercedes, the same that Kaufmann uses, and I have the part numbers of every Unimog, sedan, sport car, jeep and tractor, but not for the 2626, as them. Anyway, I will proceed with the project and hope not to find many difficulties in getting the pieces. The OM 402 is a well known and spread motor. I will see with the rest of the truck. you must be kidding! A 1988 MB 2626 must be found in EPC! Maybe you didn't look for the VIN, but for the type ("2626"). 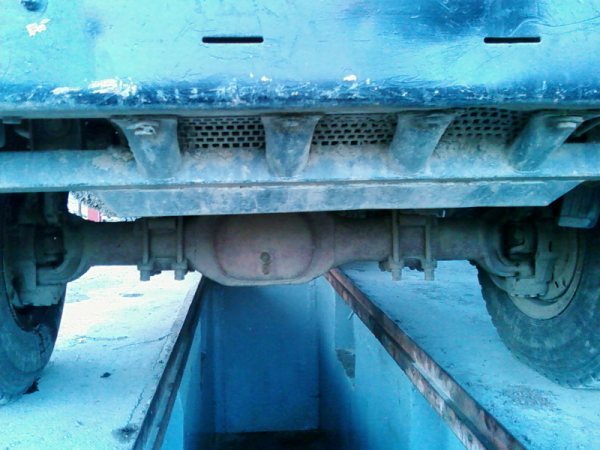 This could be the problem, because in different countries the type designation for the same truck was different (for example because of horsepower measured according to DIN or SAE standards). So what you call a "2626" could be a "2624" or something like that in Germany. Zuletzt geändert von Pirx am 2010-11-23 21:43:19, insgesamt 1-mal geändert. Unfortunately I am not kidding at all. 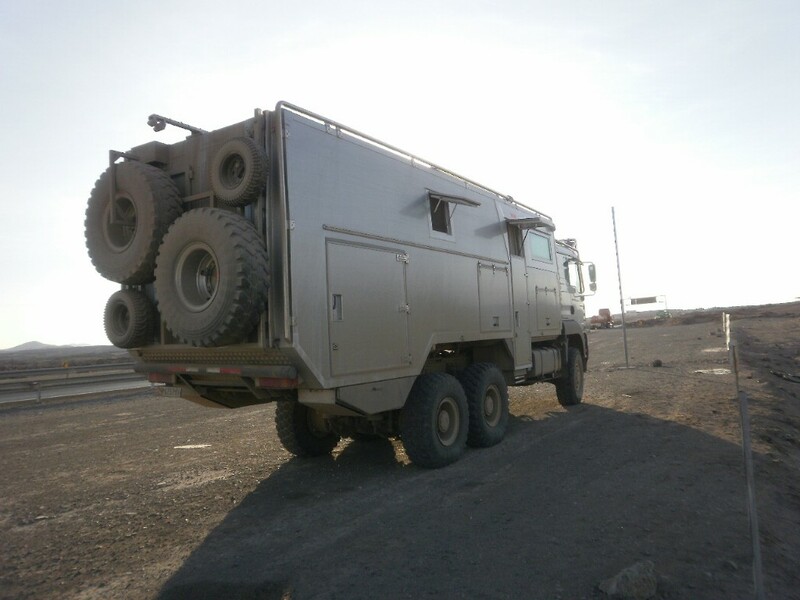 No 2626 AK 6x6 in the EPC, mine or theirs (Kaufmann). They have measures for everything for the OM 402 motor overhauling but no workshop manuals. 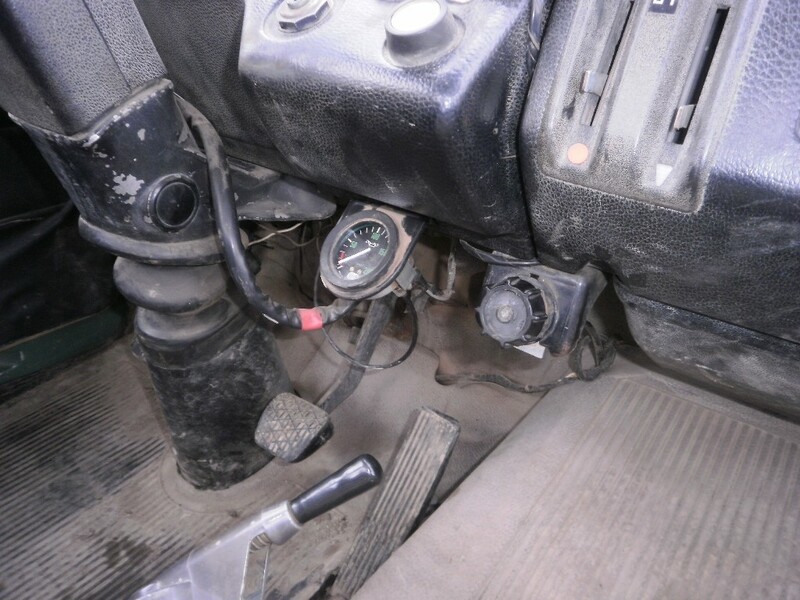 I have got some information on torque measures for the 400 series engines and about lubricants service for the ZF transmision from a very well provided and conaisseur local friend, but nothing from it is supposed to come from. That's why I bore you all, looking for help from the nearest place to the source! And, for a change, an image of the truck. 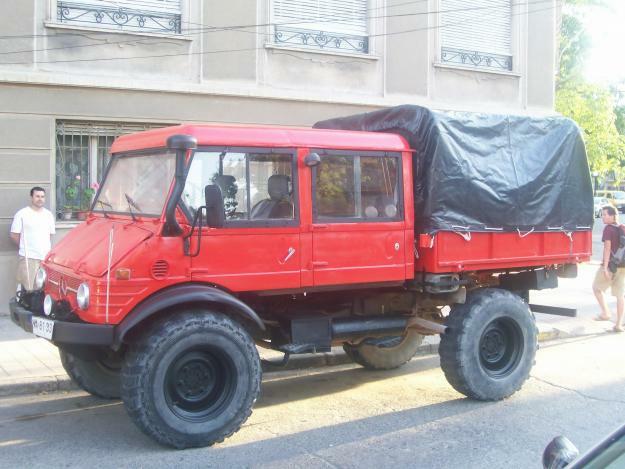 Surely there is nothing extraordinary to see for europeans, but in South America 6x6 trucks are incredibly rare. Needs lots of work (you can see the smoke! 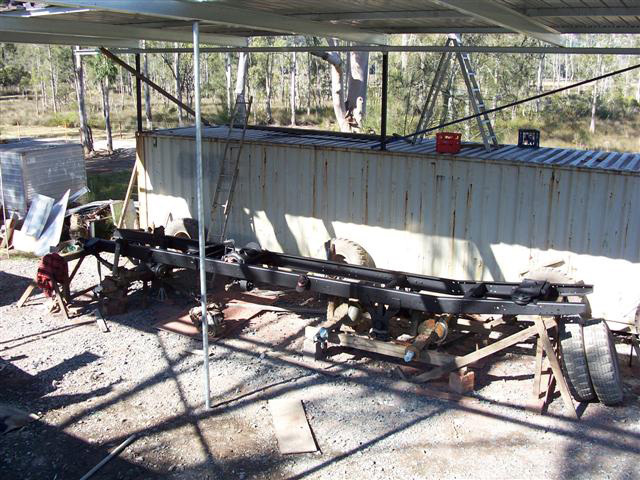 ), and at present the engine is hanging from the crane, but, manuals or not, it will be running again as if it was its first and fastest trip (at 85 km/hr). After that I will begin to build the habitacle. we are talking from two complete different things. 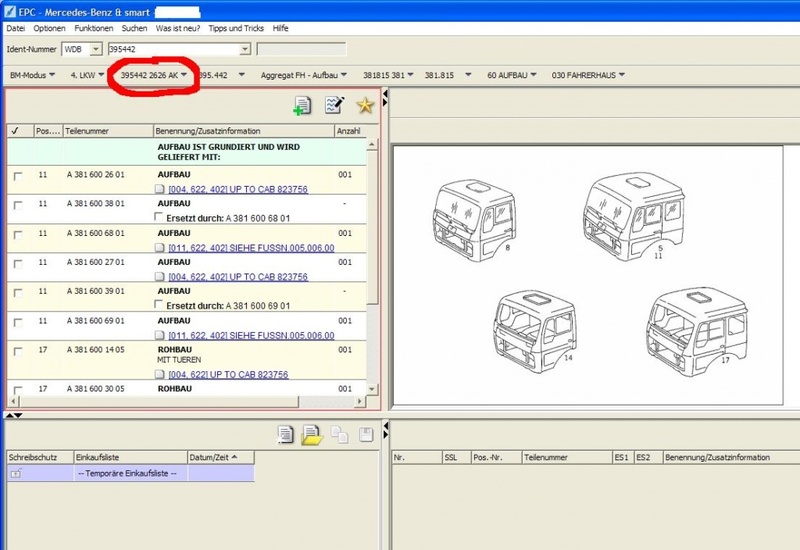 You can work exclusive with the Vin Number in EPC otherwise you get wrong parts numbers. For this workshop manuals it becomes difficult,because it is not longer available, especially in English. Send me your Vin Number and i can see how it's working in EPC and WIS.
in german.If you are interestet please send me a PM. What version of EPC is that! Nothing to do with mine or Kaufmann's as long as I know. How can I get access to that data? No matter if written in german. 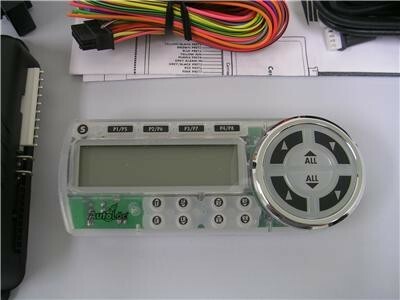 It is the latest Version of EPC which is used world-wide. The Language is switchable inside the program from german to english or french or italian or japanese or polish or portuguese or russian or spanish or turkish. 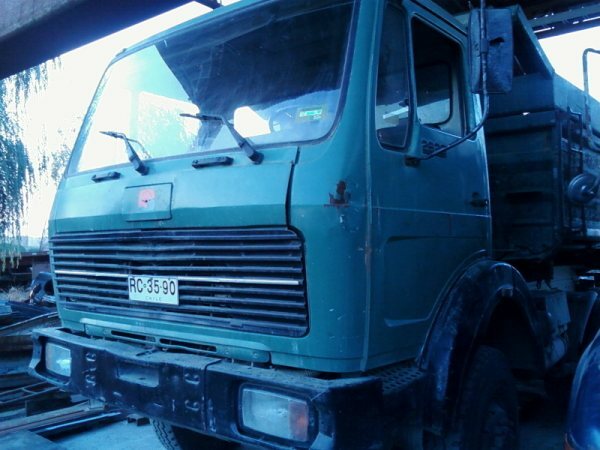 All informations about your truck are available. After many rounds I finally got the right EPC version. Had to get permision from a friend in Italy to use his adress and register the credit card in paypal-usa for the transaction. My 2626 is on line now. I feel a little dumb and like if someone had been playing tricks on me. Thanks everyone for the help and sorry for bothering. First of all, I introduce myself properly so people can know who and where am I.
I am 44 years old, I live and work at San Felipe, a small 55.000 people town 54 kilometres north from Santiago, the capital of Chile. I am not mechanician but I love to get my hands dirty with oil and grease if needed (or wanted); I love jogging and bicycling even though I have been pretty lazy for the last few months; I love motorcycles and I have an 2004 BMW GS650; I own -and drive a lot- a 1992 NISSAN Terrano 2,4 4x4 wich I converted to a 2,7 litres turbodiesel and practically rebuild it; got an 1995 Chevrolet S10 Blazer 4,3 and melted with a 2003 S10 Blazer 2,8 of the same kind to produce a 6x6 hybrid in a partially finished project (http://www.twistedandes.com/foro/showthread.php?t=61934 for those who are curious); I love paragliding and scuba and love to travel and love nature and camping. 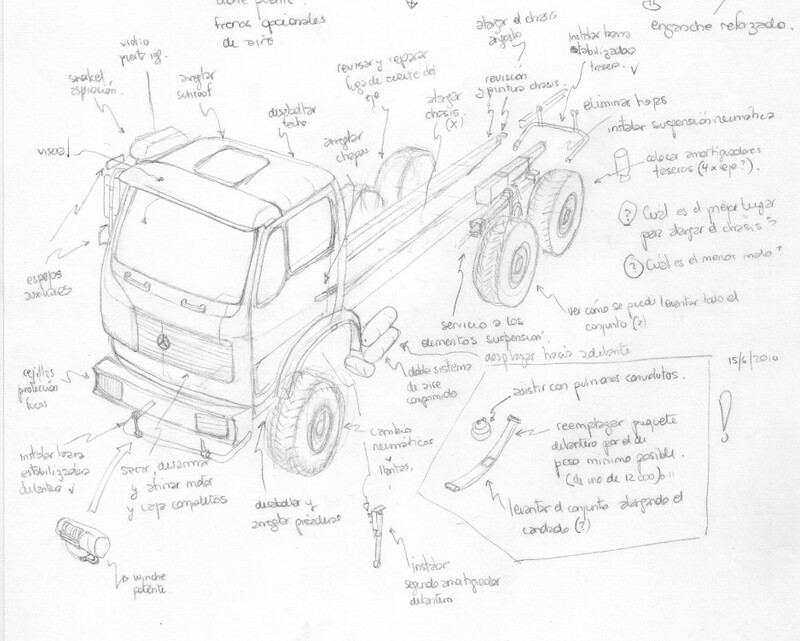 Finally I decided to tell the story of the making of my 6x6 truck, not because it was already time to do so but because the growing number of pictures, drawings and notes would soon be unmanageable. I excuse myself for my almost acceptable level of errors in my English. I hope it becomes better as I go on. 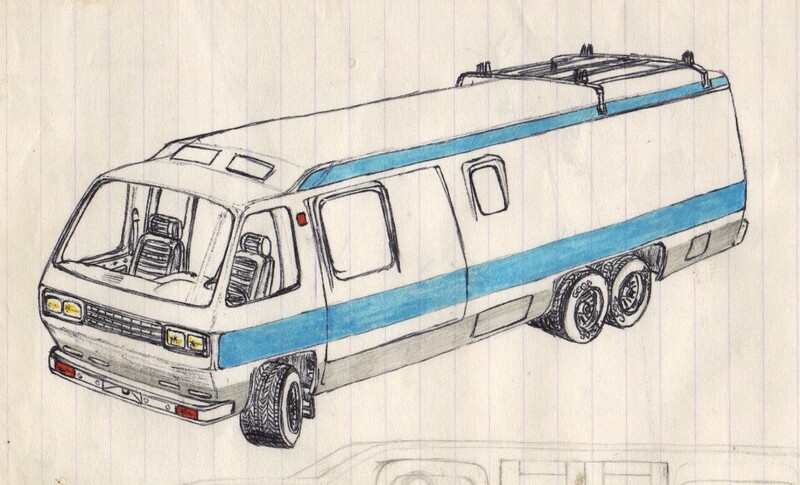 It all begins about the firsts of the eighties (or maybe the lasts of the seventies) when my father, a very skilled and ubiquitous man, asked me to design the general idea for a motorhome he wanted to build from a Mercedes little urban used (and very old) bus he wanted to buy for that purpose. 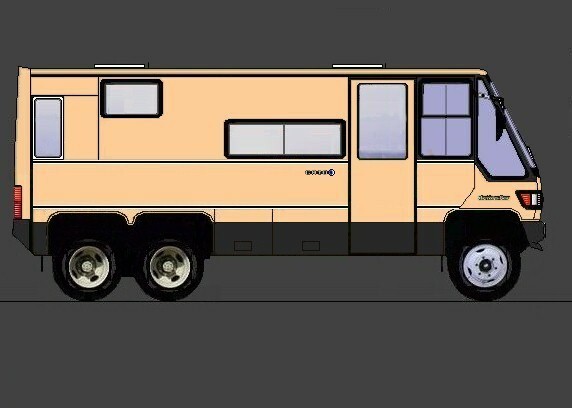 In a visionary leap he wanted also to build a slide-room in it, one of those that never miss in today’s motorhomes and campers designs. 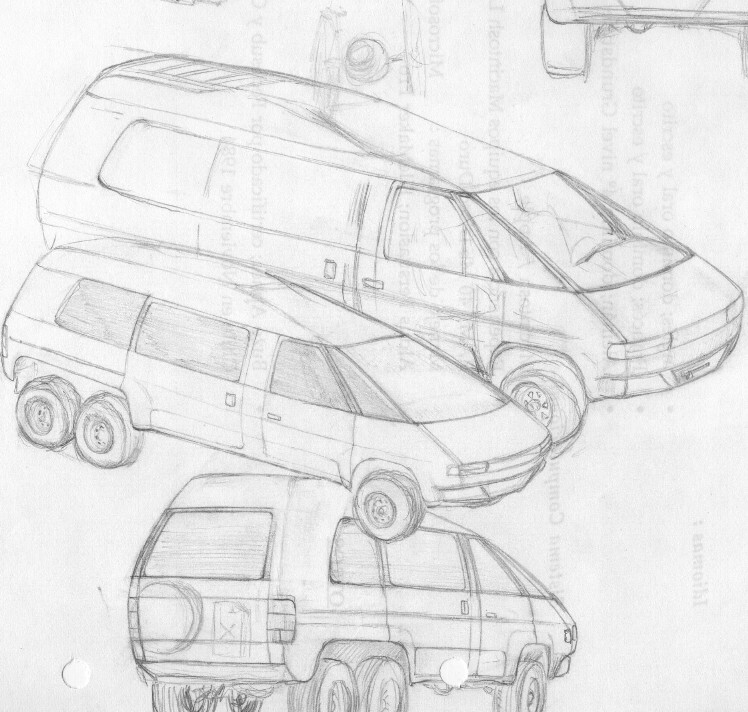 Within the hundreds of designs I used to draw in the school copybooks instead of doing my homework I draw the one that appears on the first photograph, but adding on my own a third axle and shaping it with modern lines. I liked it so much that I still have that page between my stuff after circa thirty years. 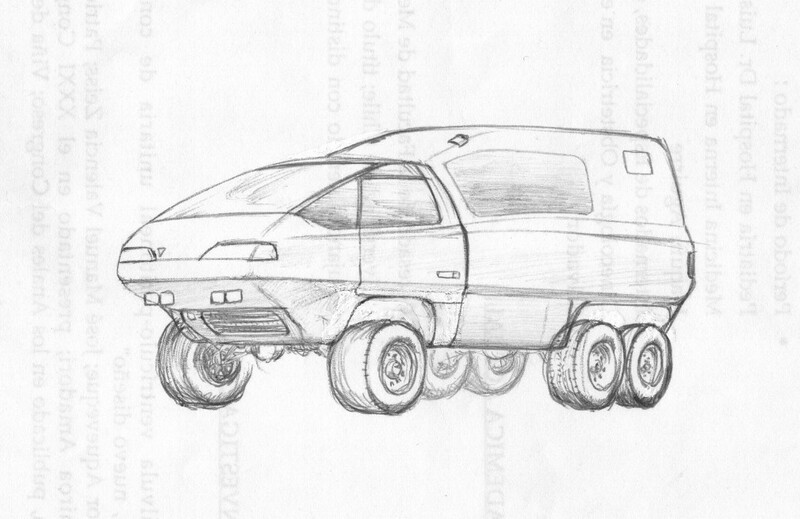 Unfortunately my father never materialized his project and it remained as one of many ideas that never saw the light in time, though, every now and then, I picked up the vision and made turns on my mind with it, drawing more futuristic versions, always with three axles (I don’t know why, but I go crazy for the three axles). 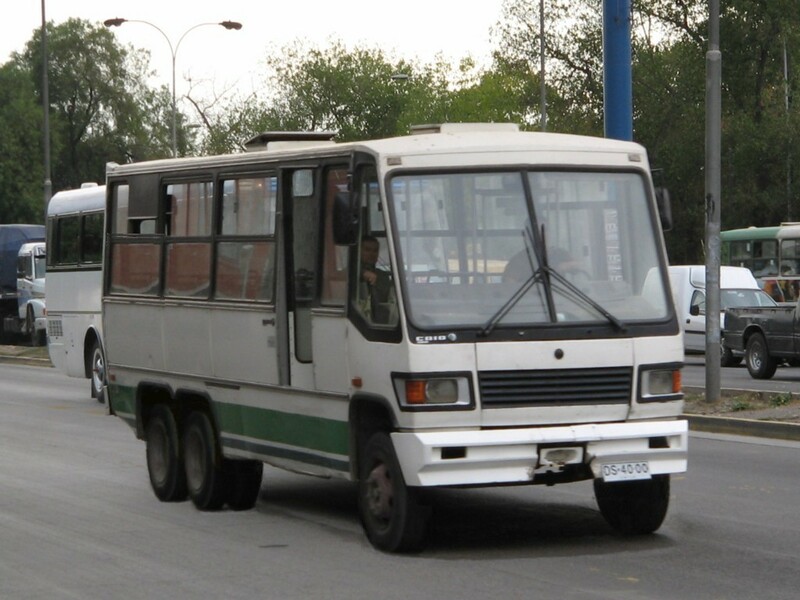 At that moment it seemed appropriate to take a used urban bus of brazilian make with Mercedes motorization, from 1990 to 1994 to be OK with national laws and regulations, and put in Rockwell axles as the ones used by the 6x6 REO trucks of the army. 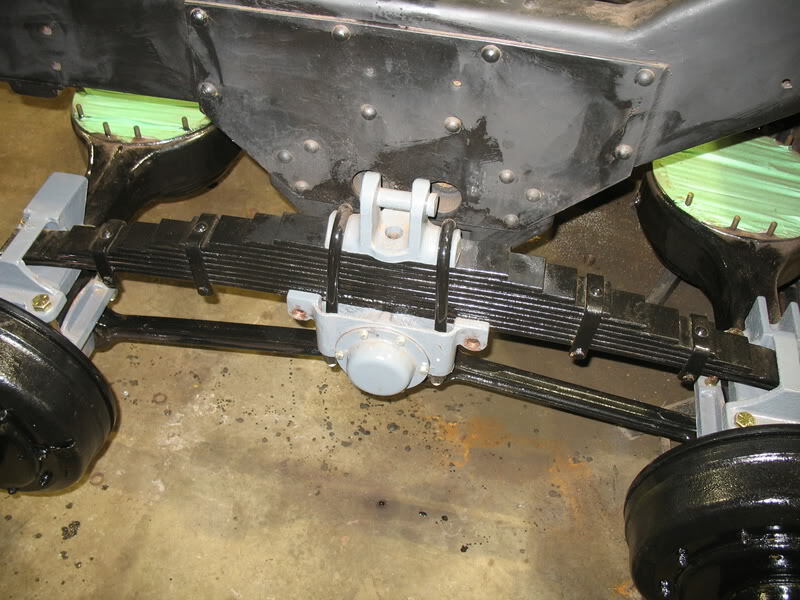 Doing some research on a previous project I had seen that some other people had made it (or something like it) before, but my intention was to take those axles and put them on three-links with pneumatic suspension to regulate highness and firmness. As I said, there is always someone that has done what we believe is our particular idea, many times and in many better ways than ours. 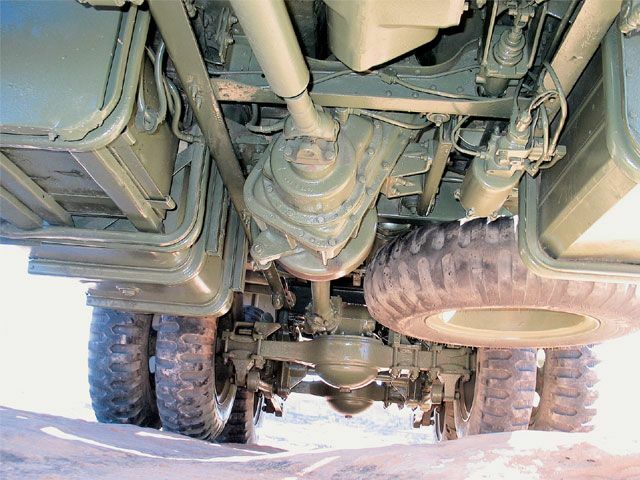 Mine was to build a suspension like the one shown in the photos taken from an Australian guy who made a really good job on that old 6x6 Bedford, and control it with some electronic device like the ones used in the little trucks and car with adapted pneumatic suspension. I studied the plan for a period of time, many months actually, and got after the right bus and the scarce REOs in the Army auctions. I wanted also to put an OM 352 to move the whole thing. 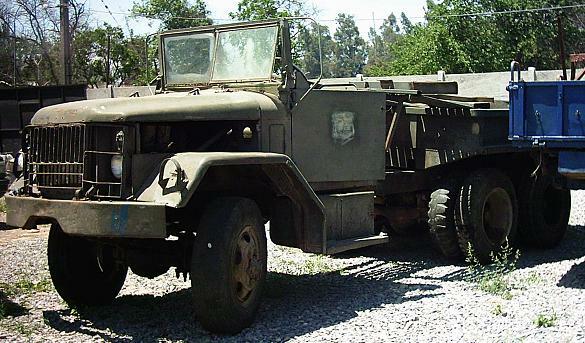 Searching on the web I ended with a young man that lived from shopping-selling old army trucks and jeeps from the army and got very enthusiastic with some pieces of a truck, complete with differentials and everything, lying on a mud yard, the one on the photo but after being dismantled. Time passed and the crush for the REO and the brazilian CAIO bus got less and less encouraging. 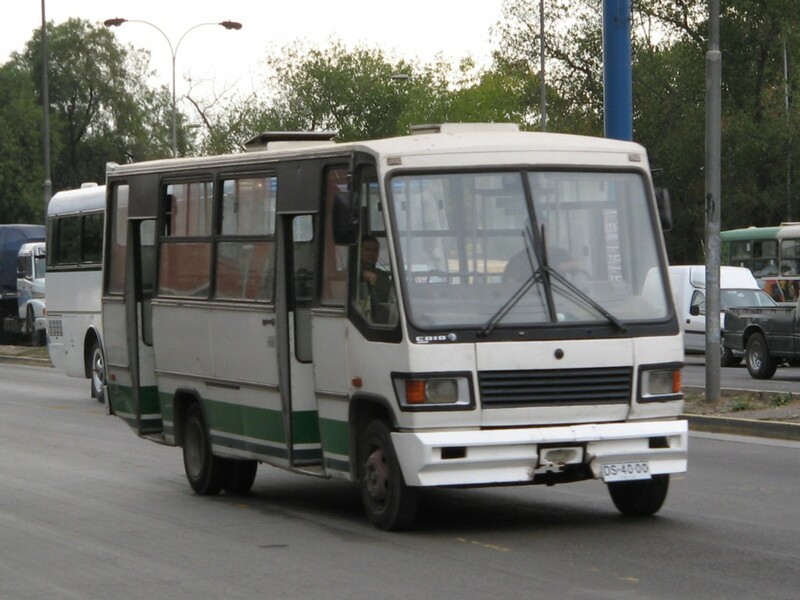 The prices of the buses nearly duplicated in three months and the complications of the adaptations and fabrications issues ended up killing it. Thanks God for it. Coincidentally (but pay attention because coincidences never, ever really exist), I made I trip to northern Chile in January 2010, and at the end of one journey visiting an old “salitrera” named Humberston near Iquique, I almost tumbled on Edy’s Robusto. It was spectacular. The vision of the magnificent MAN remained in my hard disc since then. Later on, I made a solo trip south profiting from a long weekend, to the lands of my youth where logging is an important industry in the coast area. 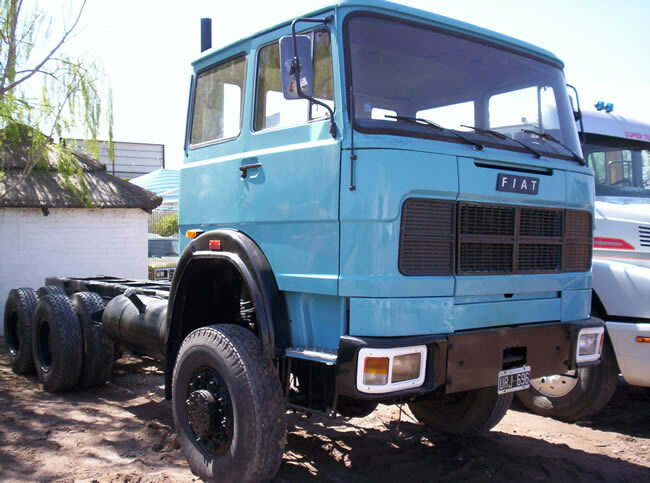 There were lots of big old 6x4 trucks, mostly Pegaso, in unequal state of preservation, some deep rusted, some like new, and very cheap to buy. 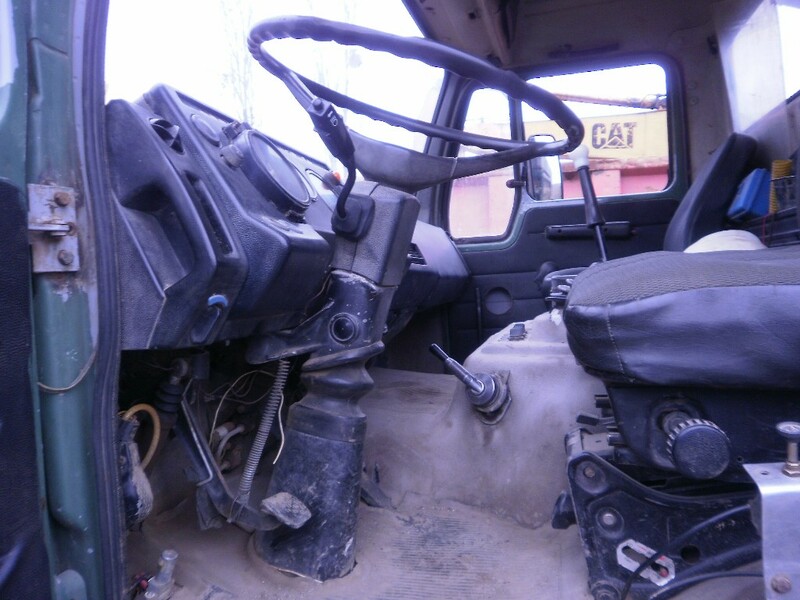 I told myself that what I really needed was an old truck already 6x6 where to build on a box to live and travel, and to forget about transformations of doubtful success. 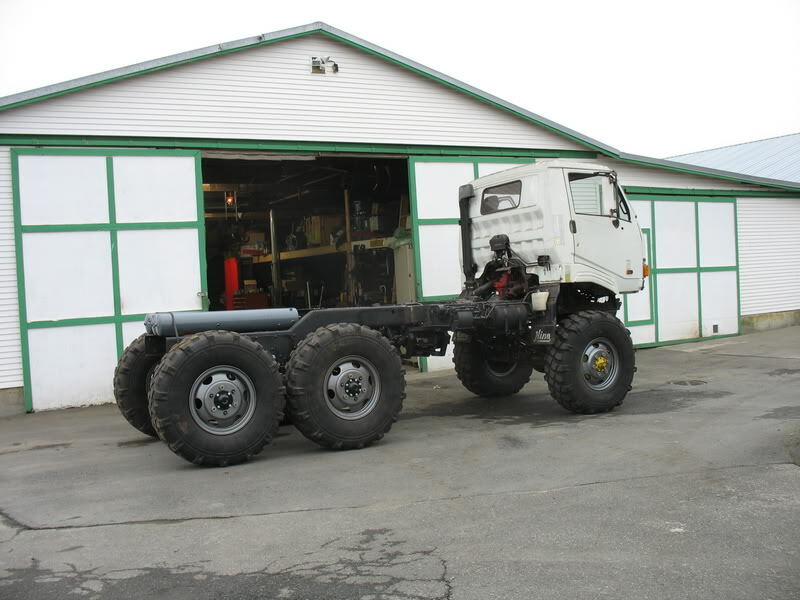 I put myself again in search, this time, of a 6x6 truck (could not be otherwise). 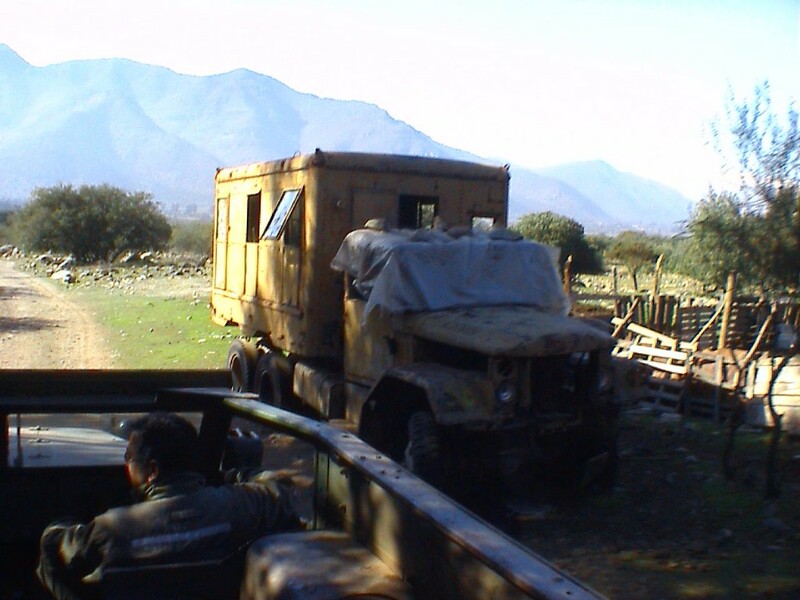 Pegasos where shortly left apart even though they were extraordinary machines and the look was very pleasant to me, but they were in extinction and not a single 6x6 was ever seen in Chile. With no 6x6 at hand I looked overseas and contacted some sellers, many of them from the Netherlands, and inquired about the possibility of importing a truck, Bedford, Volvo, Iveco, Mercedes, Magirus, but if the problem was not the price it was the taxes, dimensions, fees, insurances, restrictions of many kinds and so on. 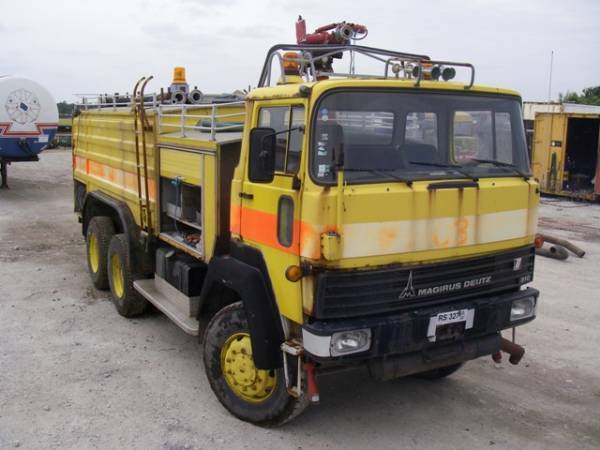 Back to the Europeans machines (in the USA there are not 6x6s other than REOs and some other monsters as ugly as Endora), I found this fire-fighter Magirus forgotten in a corner of an airport in Belgium, with only 40.000 km and some rust from the centuries. 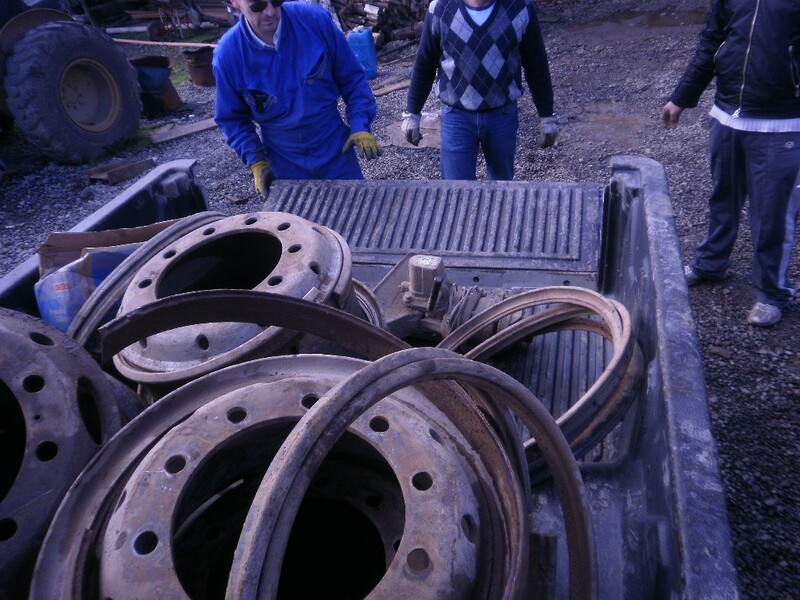 An almost german friend, Niels, acted as intermediary and made some progress with importation, but the wheels were in so bad shape that needed replacement just to arrive to port for shipment. I thought a lot about her and made lot of drawings and designs, but I desisted with not much fighting. Zuletzt geändert von pairospam am 2011-06-15 17:20:08, insgesamt 1-mal geändert. Half the text disappeared, do not know why. I will upload the whole of it and from now on I will put the pictures at the end of the post for minimizing the risks of loses. I ask for your forgiveness and patience, translating is a very hard task and from the beggining I have had trouble with the site. On a good summer afternoond some moths ago, while making a walk with my wife as we often do, an urban bus got out suddenly from a workshop in our path and almost rode over us. 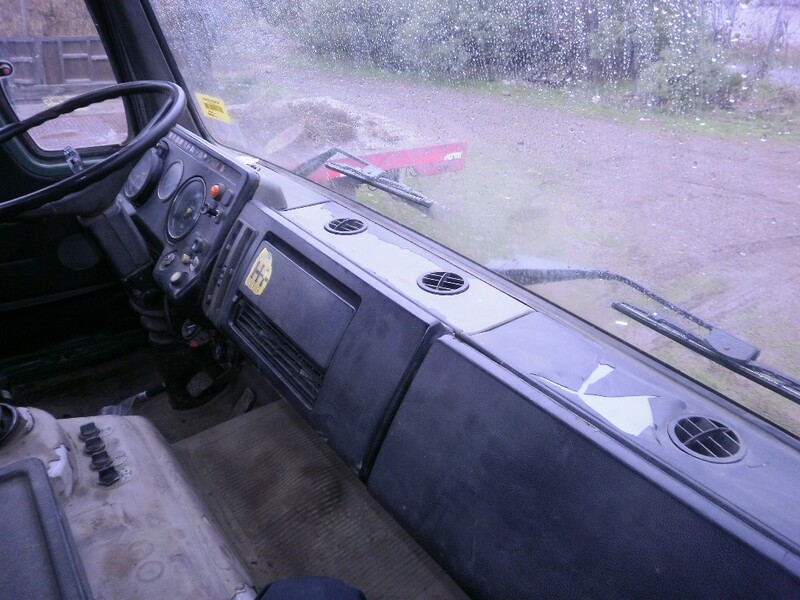 At that moment I had kind of a vision (another vision, as I could tell) and the old idea of the offroad bus came up again and grabbed my brain; not any bus but a three axled bus. When I got home I began to draw the idea that circled on my mind and, to make a long story short, after a few hours of thinking, a few sheets, a little ink and paste and some time with Photoshop and the whole initial concept was defined. 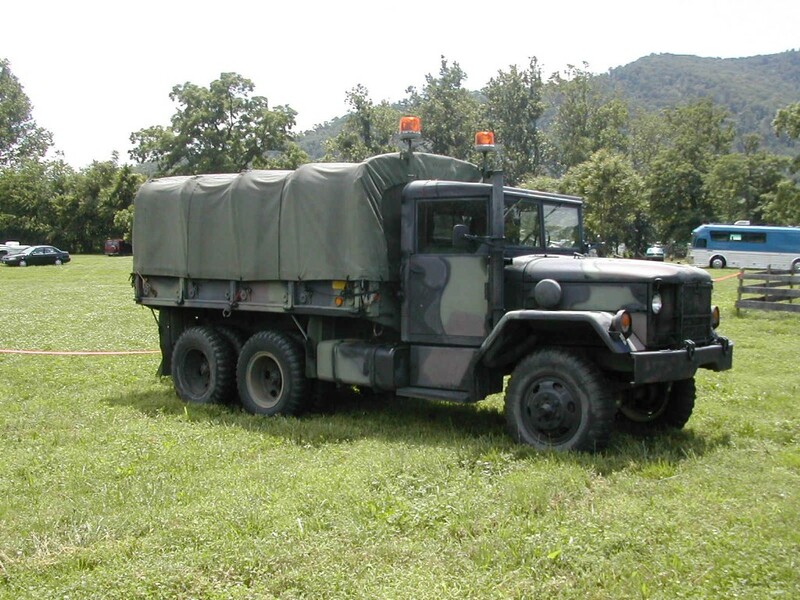 I looked then for a local “lower” solution and the opportunity came to buy a four-door Unimog, like the one in the picture but not that one, and I remembered a whole journey, many, many years ago, riding an Unimog from the Army with an uncle, a former lieutenant. It was awful. 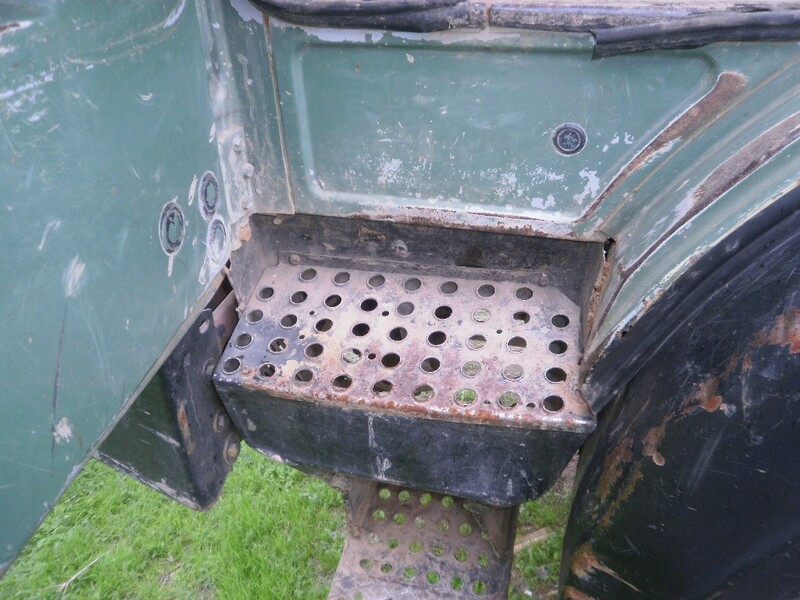 The whole idea was different and needed some comfort and reliability that Unimogs from that era do not have nor show. Then, sailing in the net I found the pictures of the magnificent World Traveller from Action Mobil, and suddenly the Unimog was forever gone. 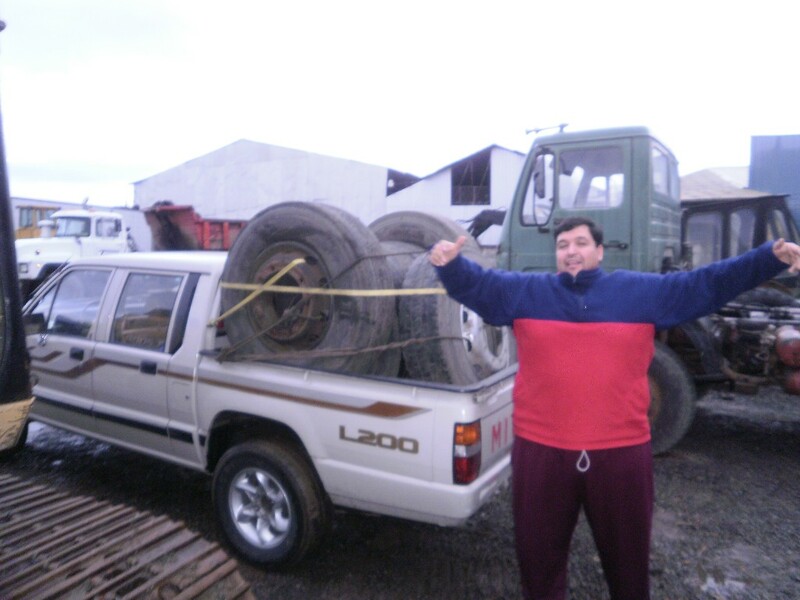 I found a couple of IVECO and FIAT in Argentina and I got again a little enthusiastic, but the difficulties related to importation even to get the axles were too big. 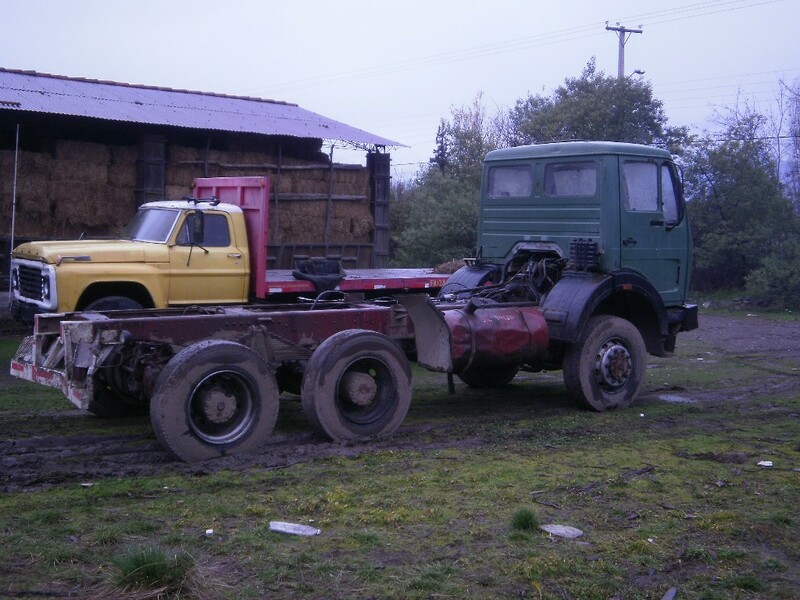 As a Chilean I am very persistent, even with wrong ideas, so I twitched a little the original plan and thought about buying a 6x4 truck and to get the front axle to convert to 6x6. 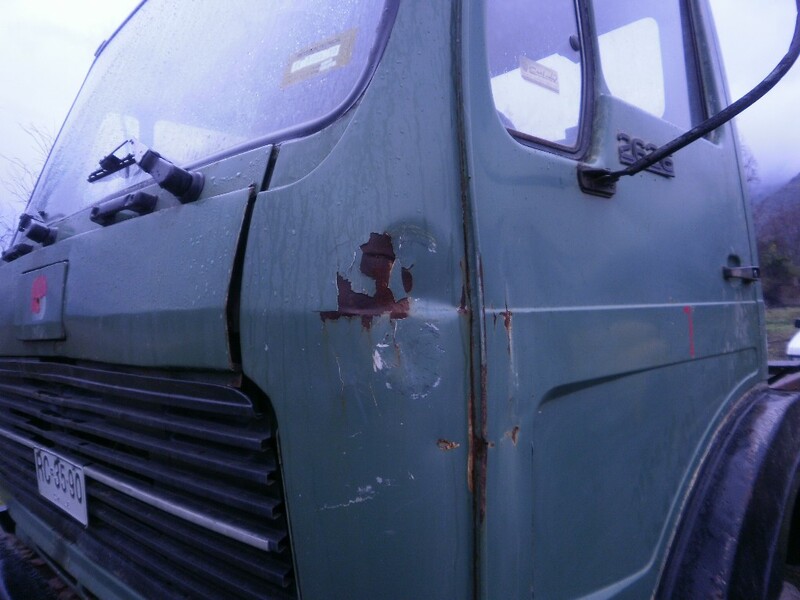 I again contacted European sellers of used truck parts, but the risk was too high to get the wrong and not the good and functioning pieces with zero chances for refunding of the money. 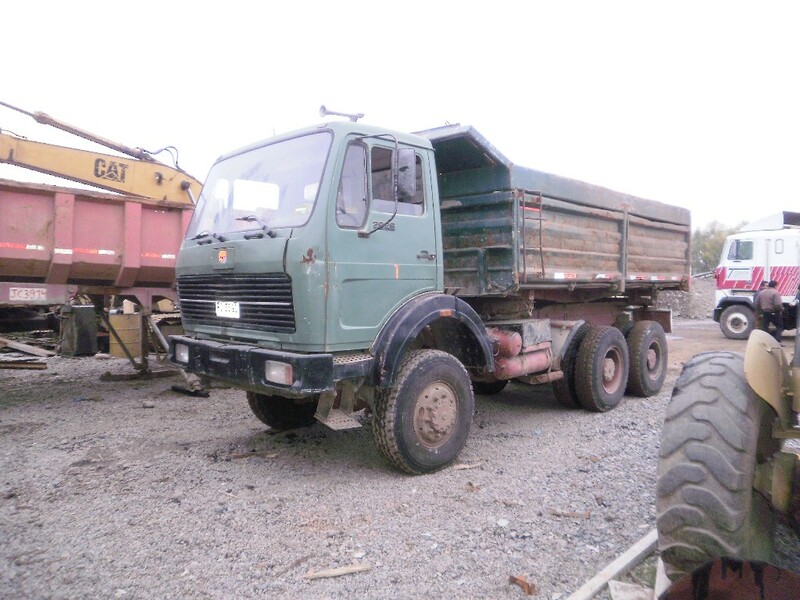 So I turned local again and searched for a restricted market of IVECO and Mercedes, the brands with better chances in Chile to find trucks, pieces and good service. 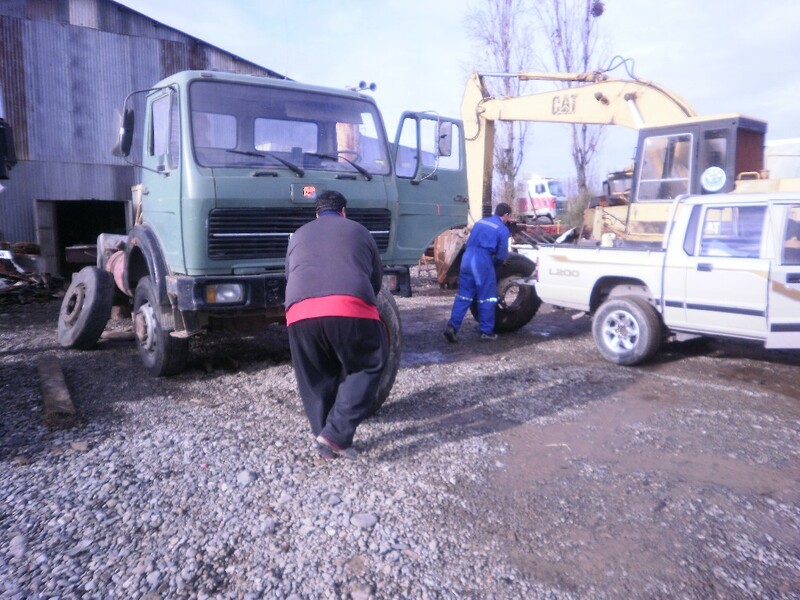 Eduardo, my brother-in-law and best friend and the best car mechanician ever existed and I looked for and saw many 6x4 used and abused trucks, broken, welded, broken down again and rewelded and bolted as hell. I really suffered. 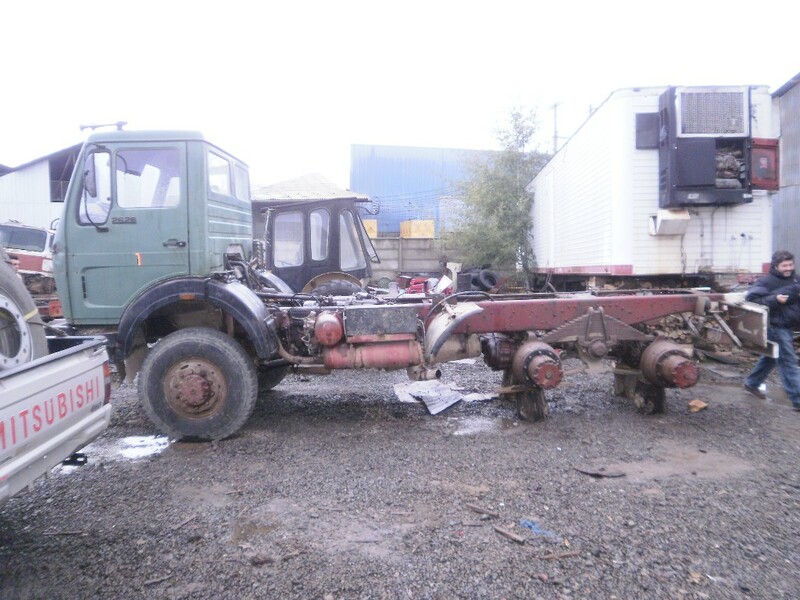 Then, one good day, I found this advertising of an (almost) complete set of a 4x4 Mercedes axles and transfer case for sale. 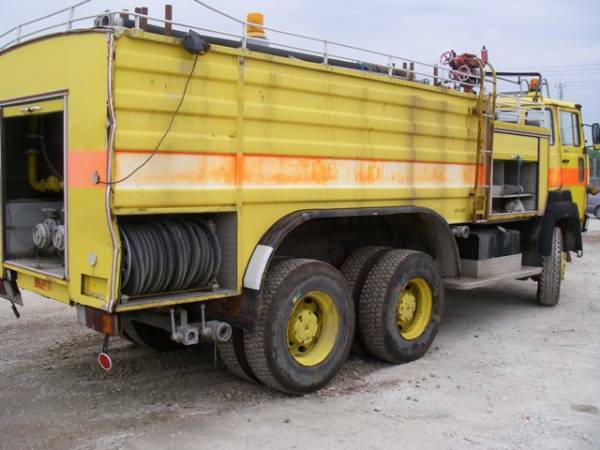 Unfortunately (but not really) the advertising was old and the items were sold months ago, but the site administrator, who found my singular idea at least interesting, searched within a ton of e-mails and gave me an already unpublished selling note of a 6x6 dump truck, with no photos. 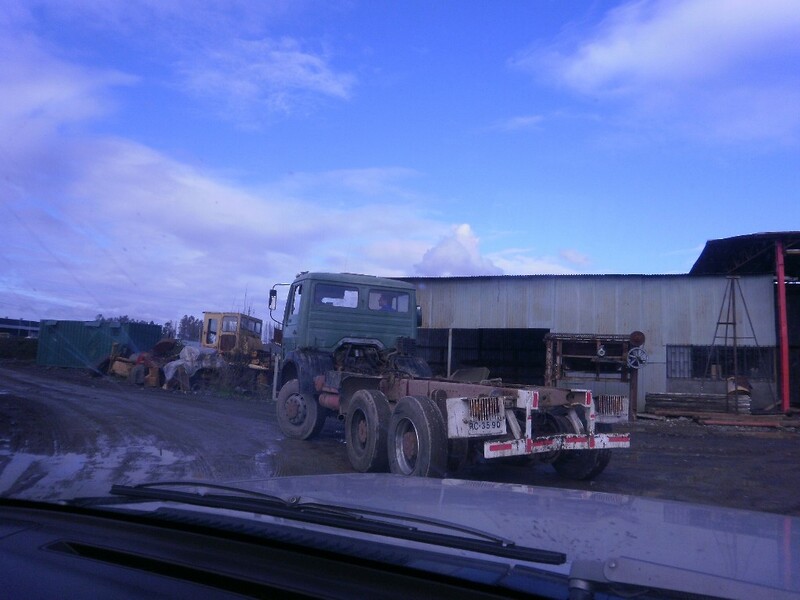 I e-mailed the supposed seller and he sent me the photos of the truck. Just by seeing them I felt some tingling in my stomach, the same feeling I had when saw for the first time the Terrano and the Blazers. Eduardo watched the pictures for less than a second and without a doubt he sentenced:”This is it”. 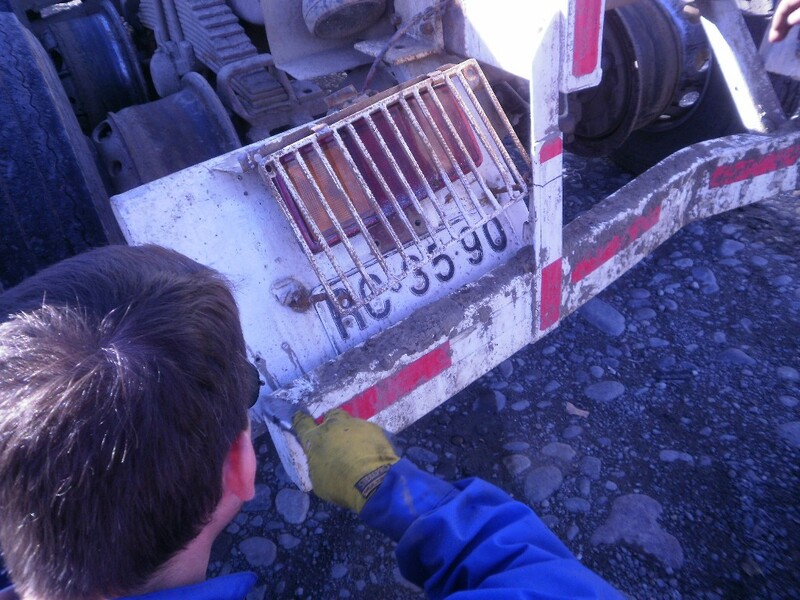 The truck was in Talca, a medium-sized city 230 km south from San Felipe. I made an appointment with the owner and the the first weekend of june 2010 I, my wife, Eduardo and his wife made a trip to see the truck. At first sight, impressive as it was for a non previously truck owner, it seemed to have been used and abused for many years without any care or love. 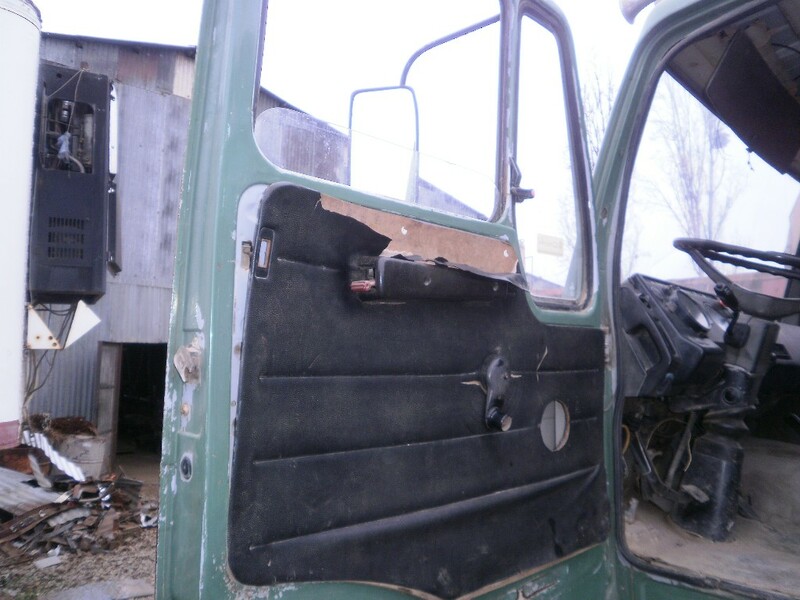 The interior was a mess, both sits broken and fixed, the roof leaking from holes of long gone warning lights, the copilot side window glass was missing, and a long etcetera. 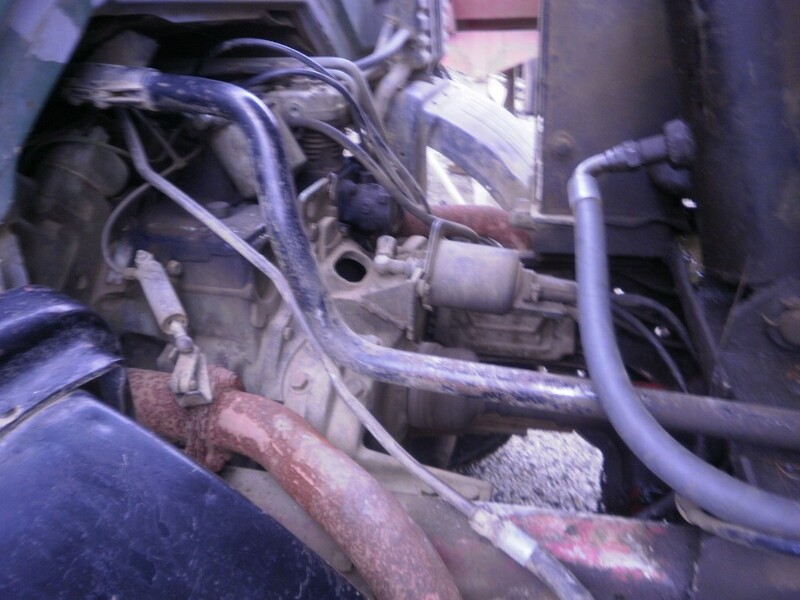 The engine was covered by a thick layer of grease and dirt and old hydraulic fluid. Though, the papers were OK and every light and system operated normally. 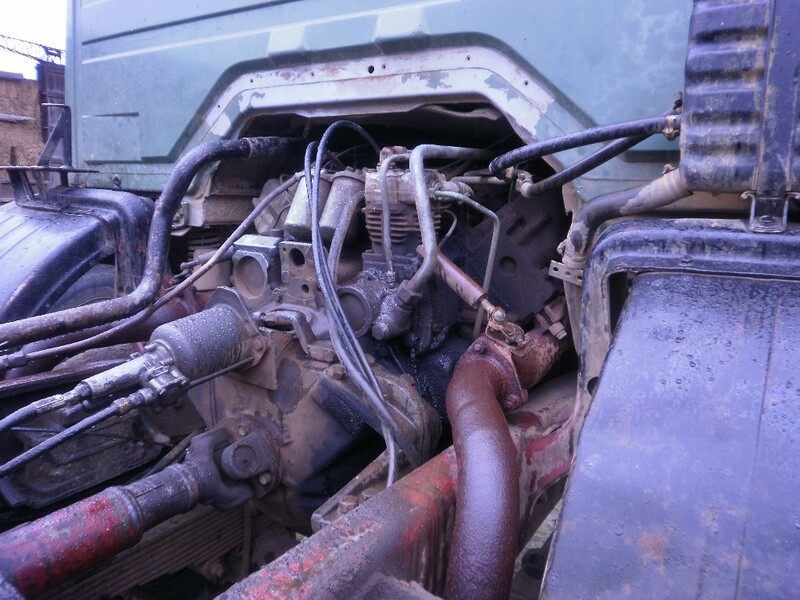 The owner started the engine and the ancient OM 402 responded almost immediately with a cloud of white smoke coming from the exhaust. The sound of the motor was unequivocal in that it will require major surgery, but it sounded good anyway. The oil pressure was a little low. The selectors were all running. Eduardo started the treatises because I am a disaster as a buyer as my face reflects clearly my enthusiasm (and my anger). 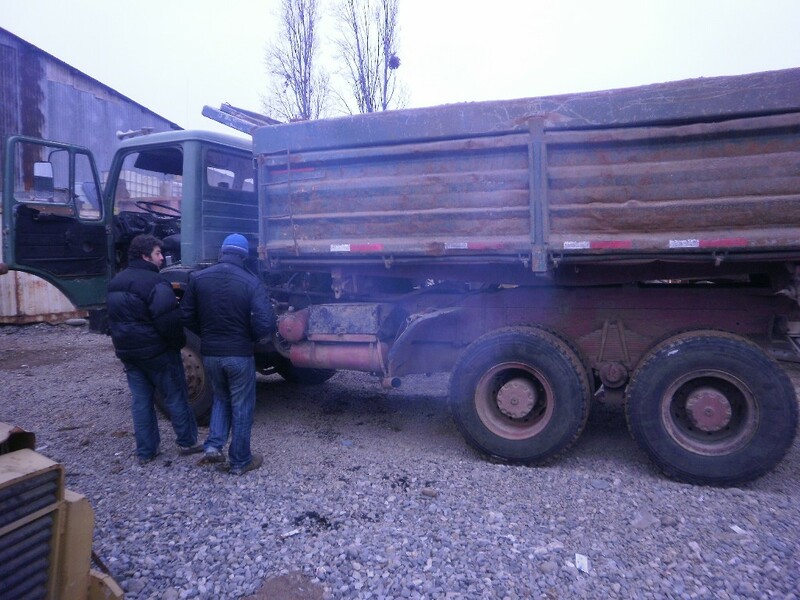 We made an offer for the truck without the dump box and without the wheels; they would be for no use for us. We returned home and waited with a little anguish from my part because I wanted that truck very much and could not stop drawing and thinking about it. 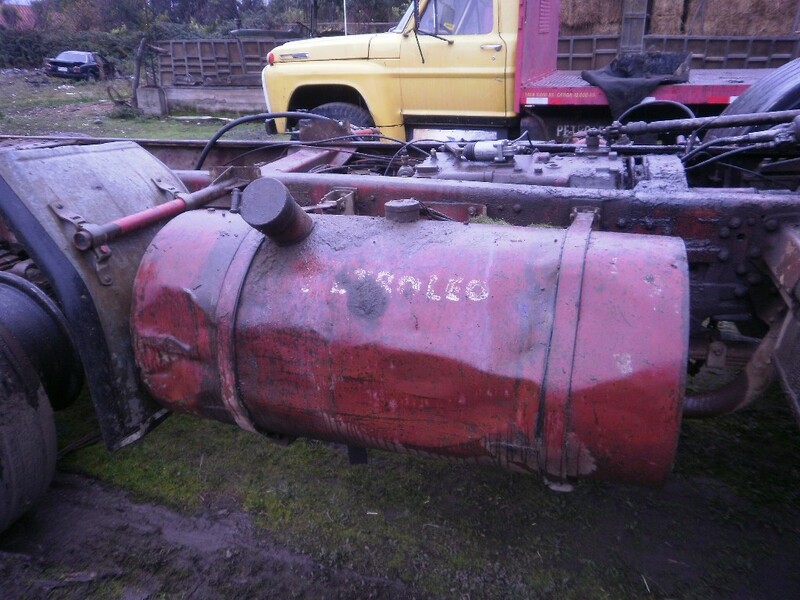 Finally, he called back accepting the offer but he would keep the dump box hydraulic piston and the hydraulic tank. The pump was to remain in the truck. 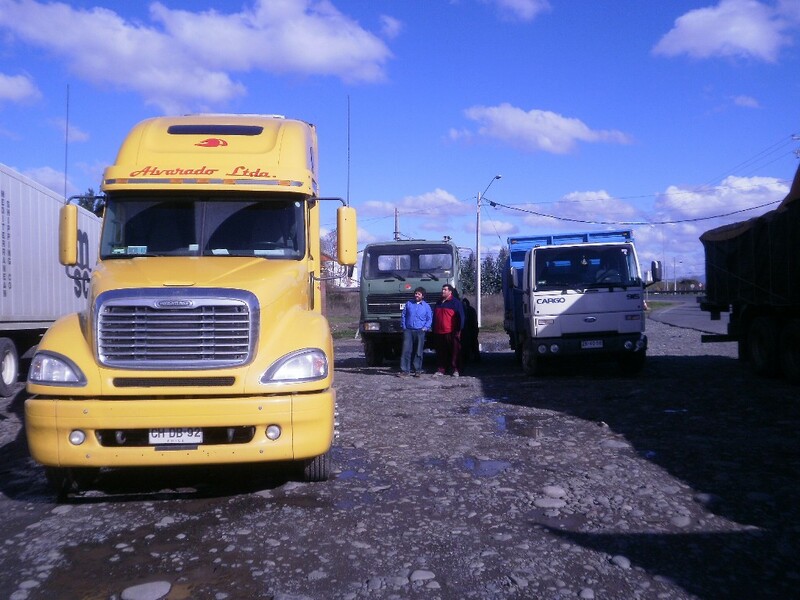 The next weekend I took a bus for Talca and in a rush I made the whole bureaucratic tour with the owner for the acquisition/selling of the truck. I paid way more than expected because I did not know of certain taxes but, in the end, I came up, exhausted, with a truck of my own. 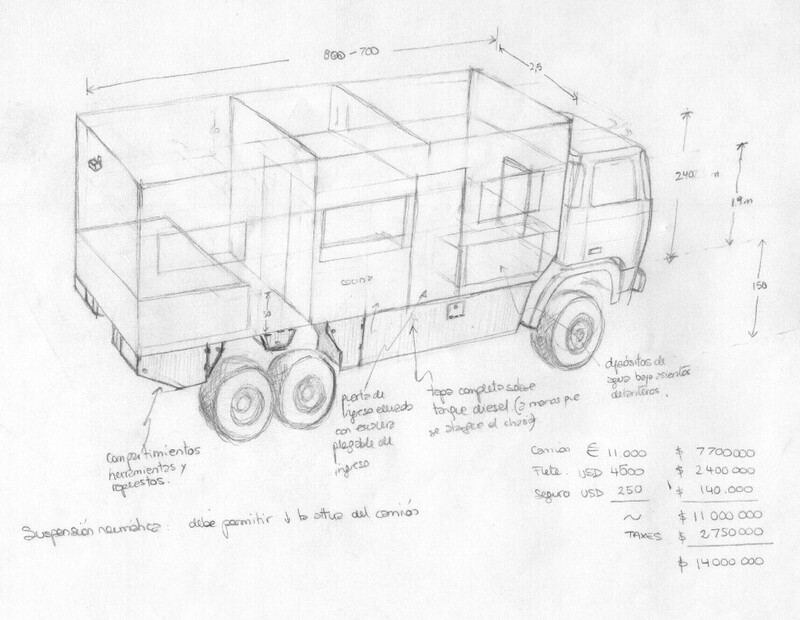 The next week I prepared the logistics for the trip to get the truck and to take it to San Felipe. I borrowed from a friend the wheels to put on; they were previously and obviously used but he assured me that they would stand the trip without tearing apart. I only had to trust. 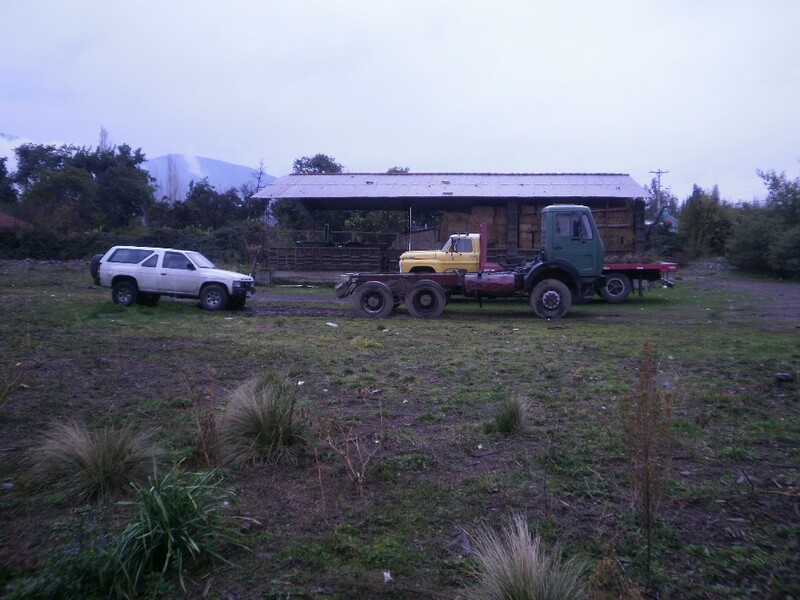 I got a truck driver that worked for an uncle that would wait for us in a city by the way to Talca. None of us had a truck driver’s licence. 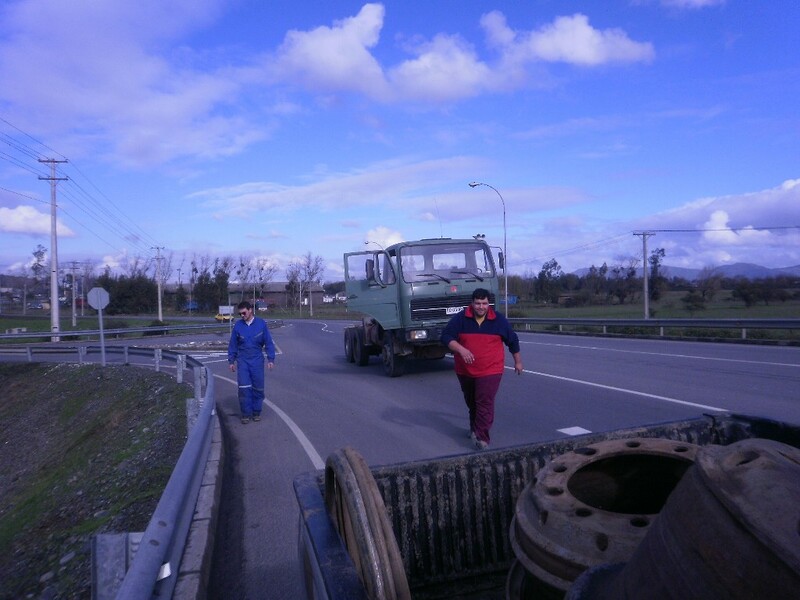 So, before dawn the 17th of june, I, Eduardo, my wife (Eduardo’s sister) and Alejandro (a 200 kg argentinean friend and employee) got the highway heading for Talca. We picked up the truck driver one hour before arriving and he did not stop talking until we got there. Alejandro was the happiest to get out of the car, a 1992 Mitsubishi L200 4x4, by far the most uncomfortable rear seat of the world. As you will see, Eduardo and I share a crush for old cars, meaning first nineties cars. The place was a dumpyard, or almost. The past night rain turned the soil to mud. 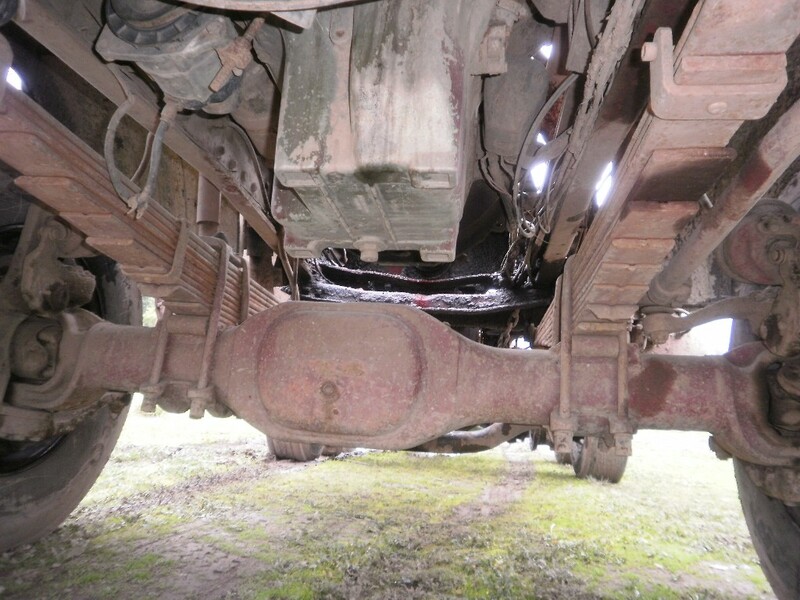 The truck was not completely on stands as intended and the absence of the dump box revealed more clearly the dirt under which the truck remained for who knows how long. I had a bad feeling. 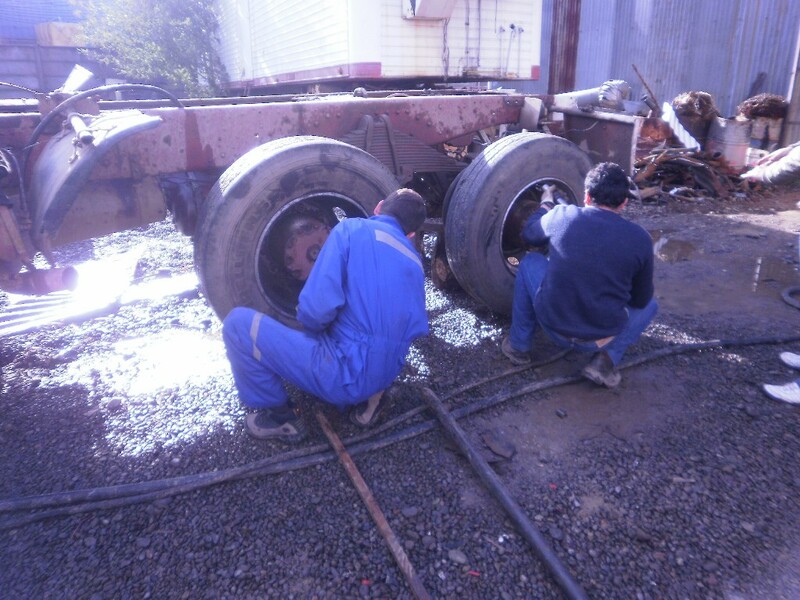 We started to put on the truck the wheels that we carried and to take the rims out of the ones which were there. We had to take them, in many trips, to a man nearby that, with his hands and a few precarious elements, took off the rims without any perceptible effort. He charged for every wheel as he was using the last brand new hydraulic tool, though. Eduardo watched a lot, giving instructions for the safety and care of our backs and hands. 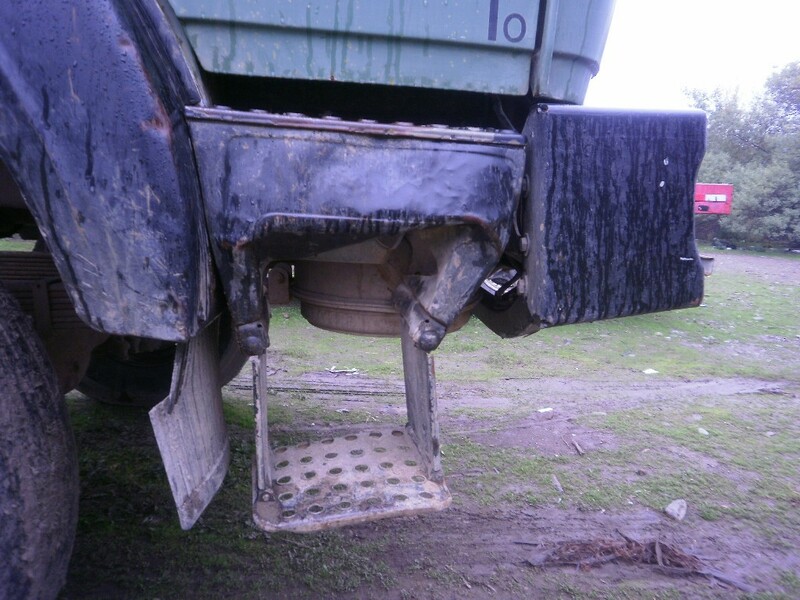 My bad feeling proved right as I realized that the owner took off the Rockinger hook together with the dump box. I love my country but I have to recognize that this is a common practice that I am not proud of. Anyway, the hook ended on the L200’s pickup along with the old rims and the truck started with less smoke than we spected to see. It took centuries to get enough air pressure to unlock the maxis and the oil pressure raised normally though it kept low in ralenti. good luck with the rebuilt! Seems really to be a lot of work. Hope you have a lot of time and money and / or good friends who will assist you. I took the copilot seat (Alejandro died for the place, but he never said it so) and with a gigantic smile and a felling like: ”I am the king of the world!” we started. I remind you that I never had a truck before and only took a short trip aboard one when I was thirteen. Obviously the tank was empty so the first stop was to put some diesel in it, not to fill it up, obviously too. I calculated a consumption of 3 km/lt and after a big “Gulp!” I put enough fuel to get to Santiago at least. I was very excited and to me the truck was and looked spectacular. Carmen, Eduardo and Alejandro were less enthusiasts. After a few hundreds meters, before getting the highway an in the middle of a crossing, suddenly a tecalan failed and the truck stopped in the middle of a cloud of dust. The emergency team immediately took charge and started to look for a solution. Don’t know if it works in Europe, but here almost everything can be fixed with a piece of wire, specially when you forget to carry some brackets. It only took three minutes and I found the wire required on the side of the road (there always is some piece there) and Eduardo applied some skill and fixed the tecalan. Back on the road the old Mercedes proved to run more smoothly than expected, even without any load. The oil pressure was within range and the RPM allowed for almost 90 km/hr. It speeded up better than I thought but steering and brakes needed urgent servicing. When it came to pay the highway toll I suffered again. 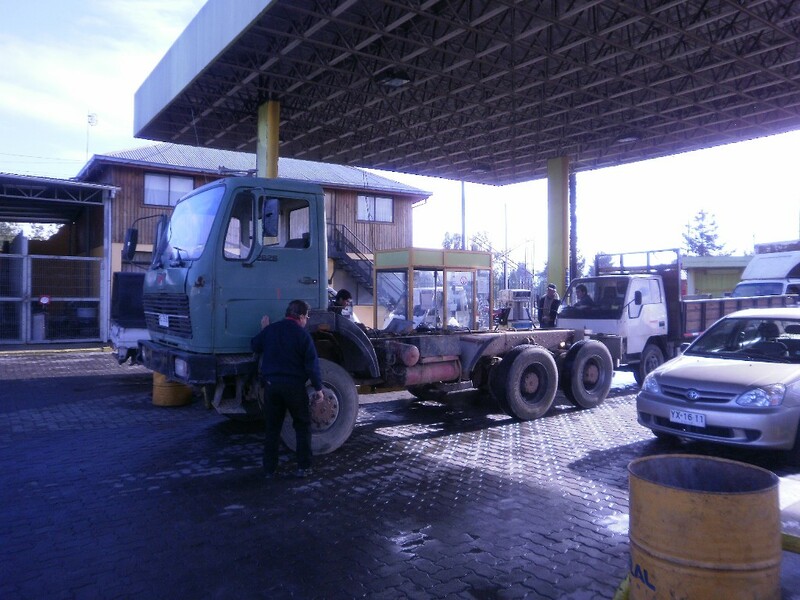 We made a stop by the police to announce that our truck was in a trip for heavy servicing, just in case we were in trouble for the wheels, and they let us continue without any problem. 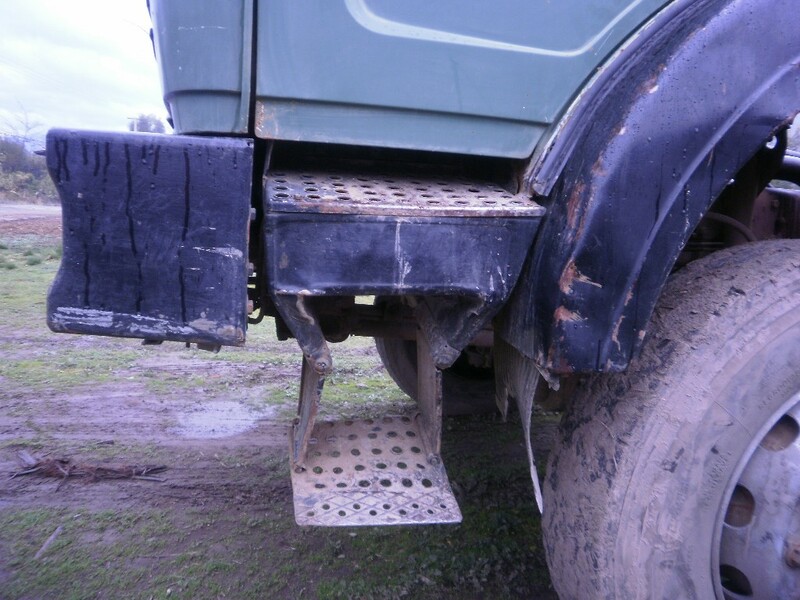 After 20 km Eduardo called to warn us that the right aft mudguard was hanging from the chassis; it was partially welded before to the box so the stand alone did not hold. Another piece of the same wire and skill and we were back on the road, still smiling. Alejandro took my place and from behind we saw the cabin bend to the copilot side, just a little. We laughed. Alejandro is our friend but he obviously has a weight problem. Just a few kilometers and the left mudguard also fell down together with the lamps and the license plate and ended almost in the middle of the highway. Fortunately we were behind. Same problem, same semi-solution, but with no laughing this time. We made a stop for a late lunch in a truck drivers restaurant. Eduardo and Alejandro remained some time staring and admiring the big new trucks parked there, like saying: “These are trucks for real!”. Traitors. I tried myself to perfection the fixation of the mudguard and worked on the lights. The rest of the trip was uneventful. 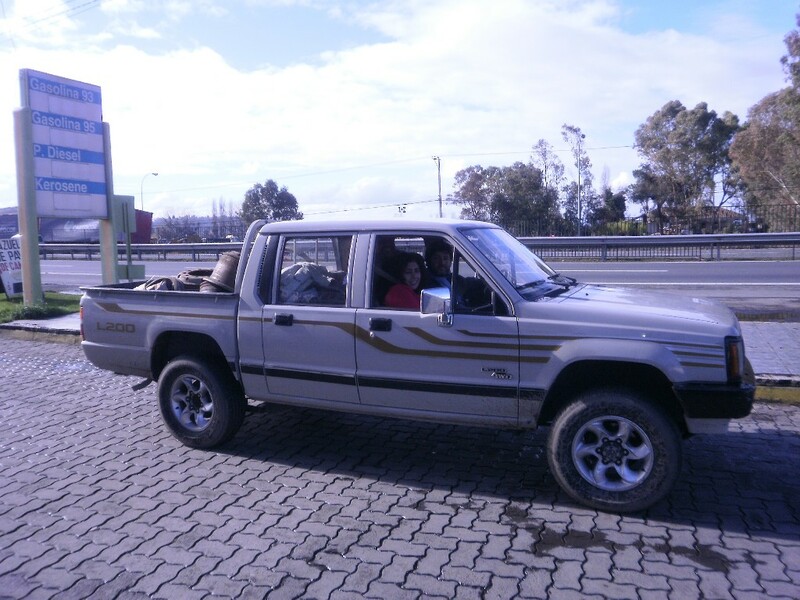 When we arrived to Santiago we made a stop to refuel and I dispatched home the driver by bus with a big tip. He was old and started to complain of backpain because of the broken seat. Surprisingly the consumption was far less than I calculated, of almost 4,8 km/lt. I said that none of us had a truck driver’s license, but we took the chance and arrived to San Felipe with the truck, profiting that the road was almost empty at that time of the afternoon. 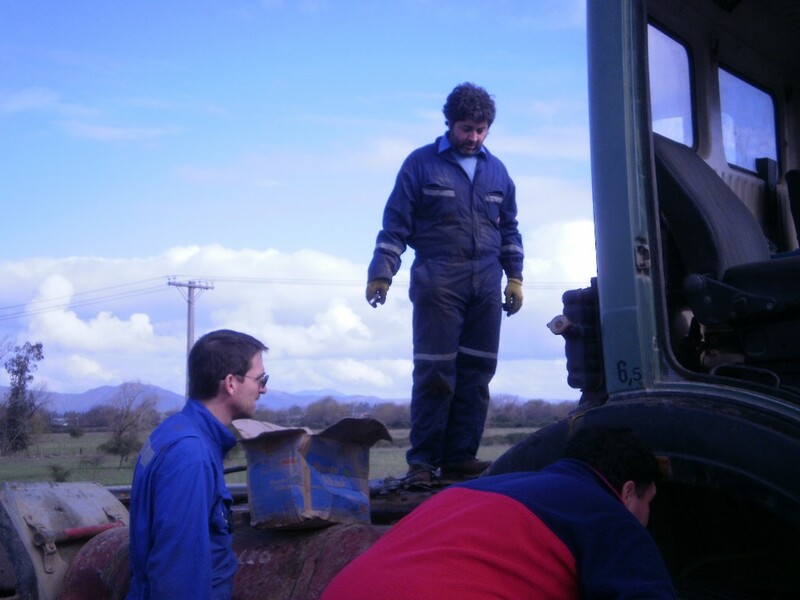 The truck did not fit in Eduardo’s workshop (we knew that, obviously) so we took it to the country and parked it there, where it would stand until it was time to begin the overhauling. Fortunately I have enough (I hope) of all of them, but I always privilege good friends. The end date for the project is December 2012. You seem to have real work on your hands now, the machine does not look too well right now. Your timeframe is quite sportive as well. Many thanks for the words of hope and best wishes. This is intended to share experiences in the understanding that many of us have a common and particular interest, and the pursuit of this vision may be very different depending on the place you live. You forgot to mention, apart from time, money and friends, PATIENCE, tons of patience. In south America things are quite different and often much more difficult than in northern countries. Chile is probably the most advanced country in comparison with our neighbors, but we lack of an industrial culture and our productivity and problem-solving activities are still quiet low and slow. We import almost everything and, on the other hand, every BMW or Mercedes has some grams of chilean copper and minerals in it. Every part of a car and the car itself almost doubles the price compared to its country of origin. And, the most important fact of all: we, those who have these “original” ideas, are extremely rare. 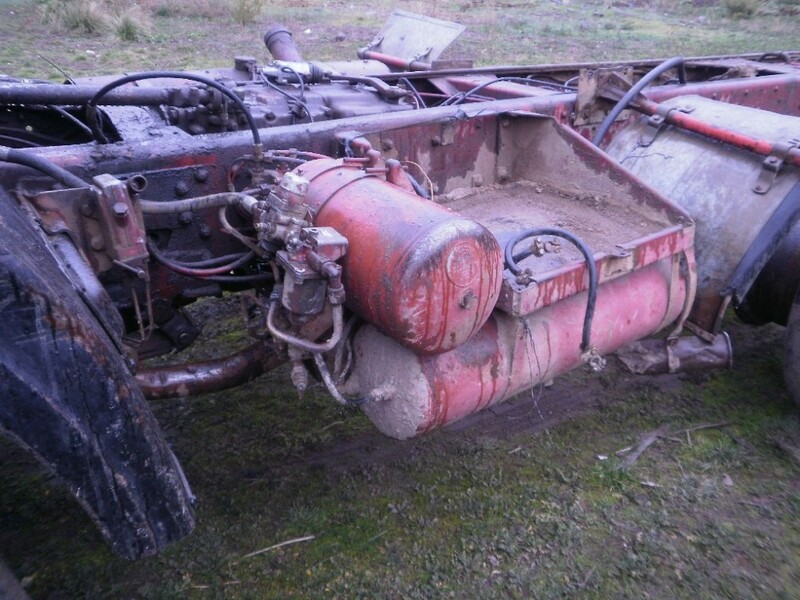 So, life can be very hard at the time you decide to fabricate youself an allrad wohnmobile. Well, said so, I go on with the quest. Once in its transitory parking site at Eduardo’s family country-yard, the truck began a long pilgrimage that finally would transform it in an actual object of cult, at least for me. Its name, Merkabah, came with no sign or advice, as always do occur with things that you believe are coincidences but that in reality they never are. It refers to a mystic object, kind of an interdimensional vehicle to transport, only with the energy of your desire, alone or with company, from one place to another no matter how remote. Naturely, this particular Merkabah do not fullfill all the requisites of the real one, but maybe it does others; I wish the engine would run only with the force of your desires, with no technical or legal restrictions for its age. 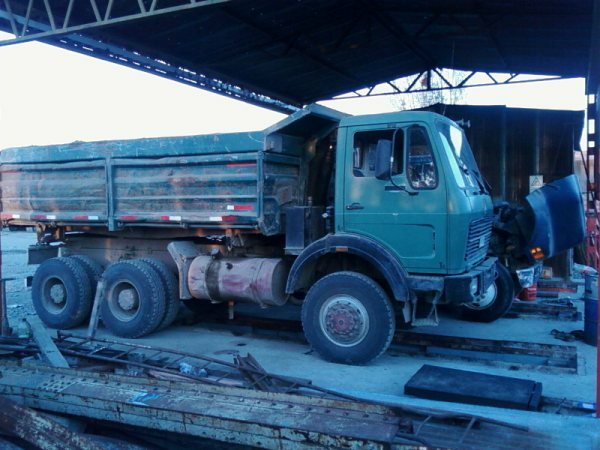 The series of pictures that follow show better some details and the characteristics of the truck, and the need for repairing or replacing many pieces and components. 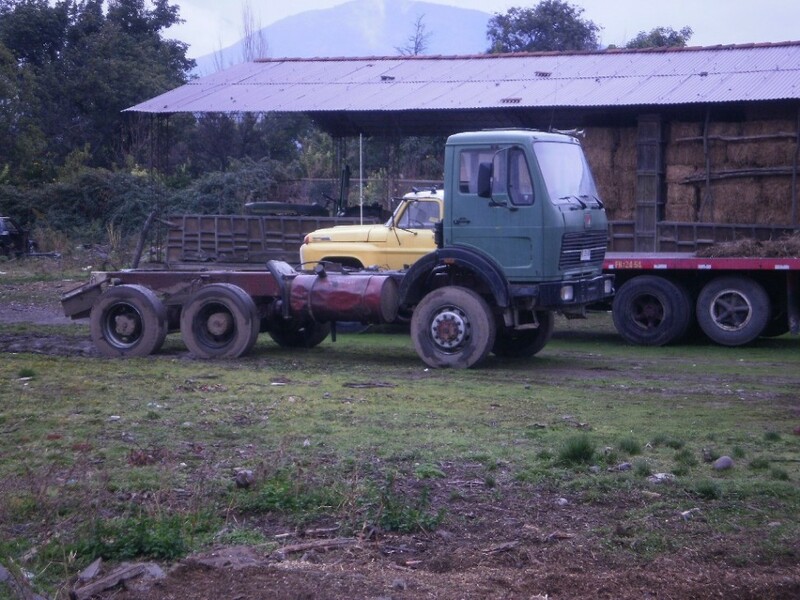 The yellow truck behind the Merkabah is Eduardo’s old Ford, used only for taking the peaches to the buyer when in harvest time. It would prove very useful in the near future. Merkabah’s oil pressure gauge was an insert, though it worked properly. 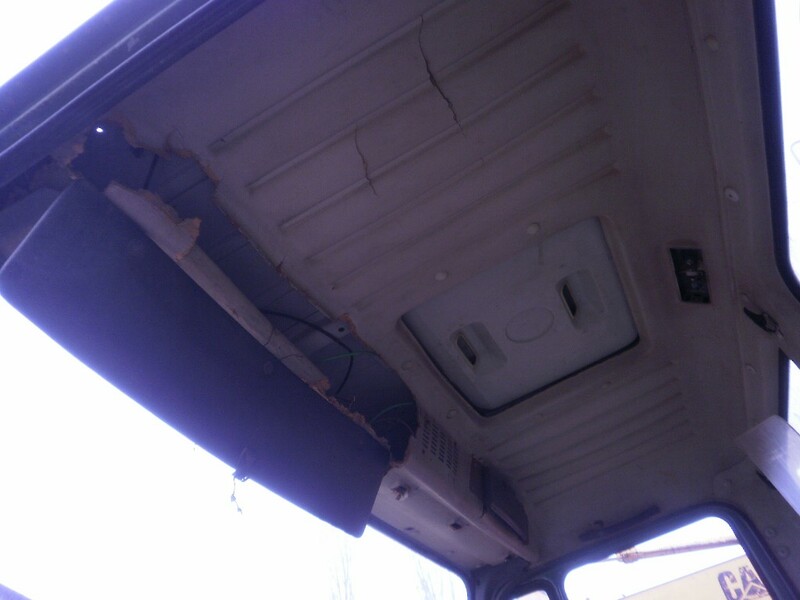 The dashboard was bad shaped, as was the roof. 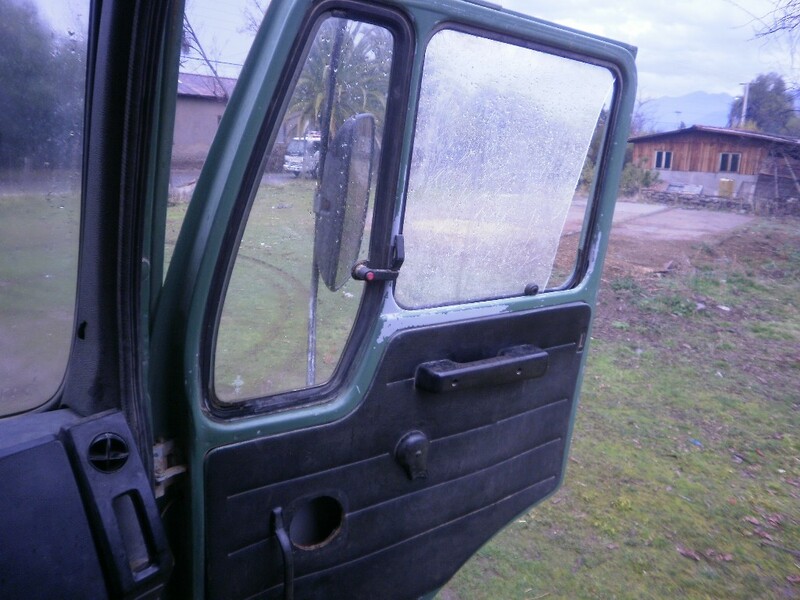 The missing door glass had been replaced by a wrong shaped piece of plexiglass and the knobs were missing or broken. Both foot rests were a mess and the one on the pilot side was even welded to the cabin. The bumper was, incredibly, pretty healthy. You could see the attempts for making up the damage of the cabin. Zuletzt geändert von pairospam am 2011-05-04 17:35:52, insgesamt 1-mal geändert. The diesel tank was terribly knocked but it should be replaced anyway for the planned autonomy should be at least of 1200 km. Every periferic component had suffered from the lack of love and hurt by rocks and every object of the road, forests or the mountains it had been working on the past 22 years in Chile. It was imported in 1998, I don’t know how was this possible because it is forbidden to import used cars, at least at present days. 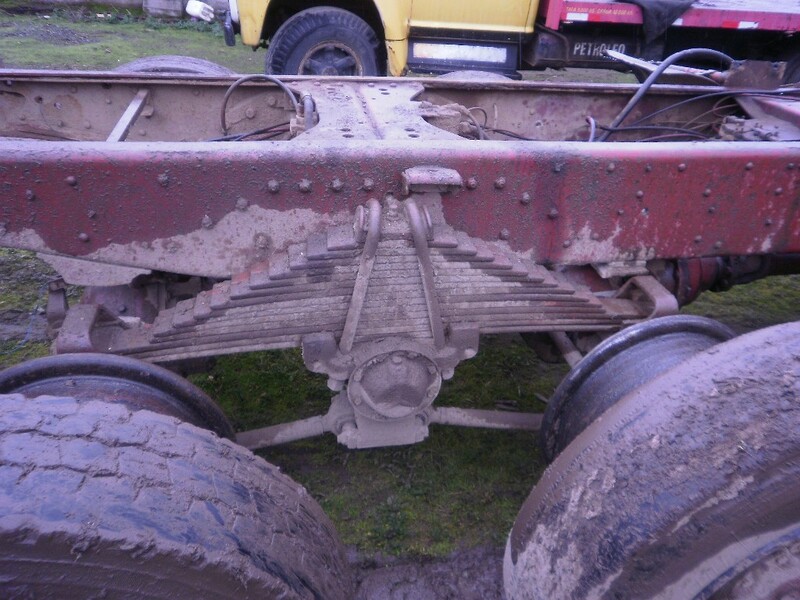 On the other side, the chassis was OK and there was not much rust all around. 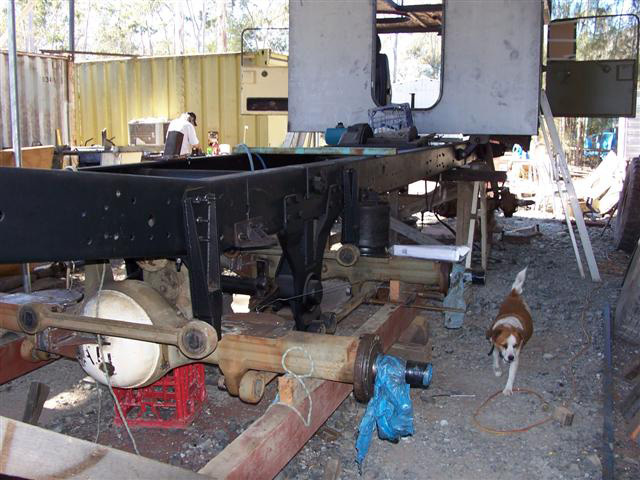 Someone had welded some pieces of steel to the tail of the chassis but this was not important at all. 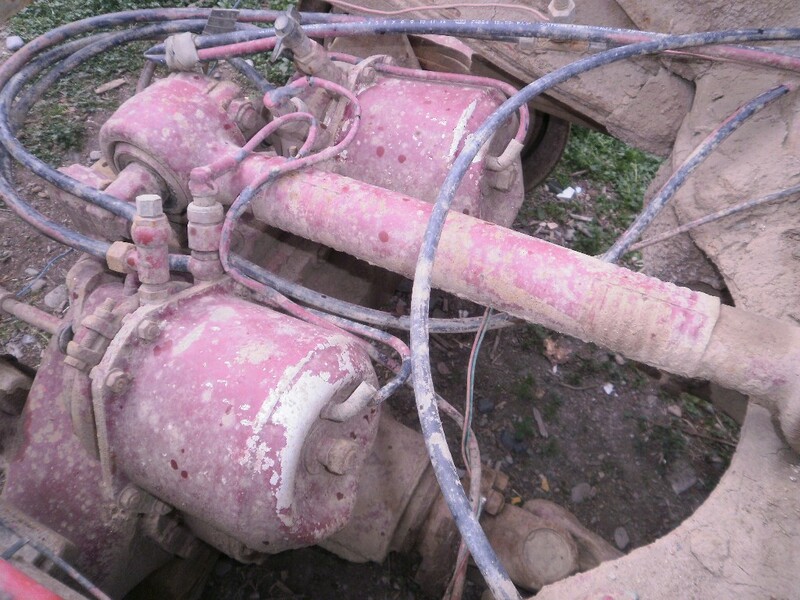 Air tanks and valves looked quite used and it would be necessary to check it all out. 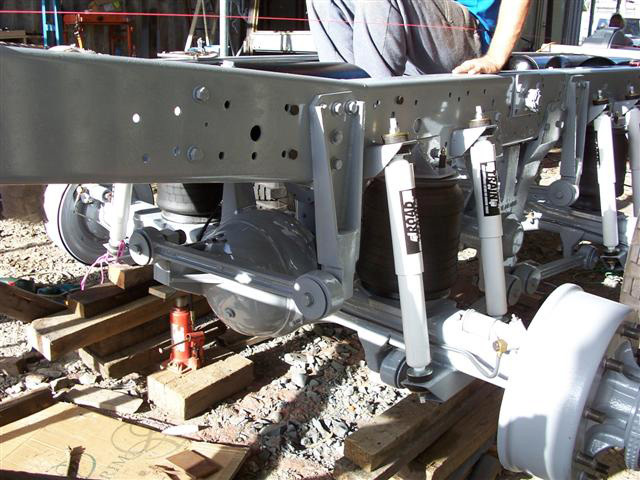 The idea was to duplicate the amount of air capacity to back up the pneumatic suspension and the remote wheels inflation system to be installed. 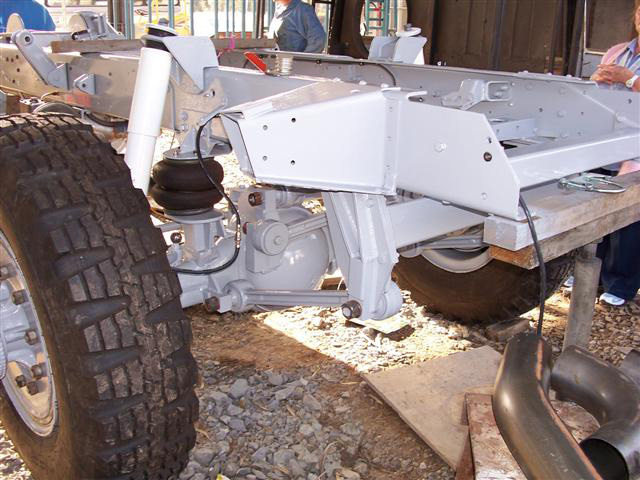 The tanks should be placed on the rear part of the chassis, somewheere between it and the box. The axles looked healthy and worked properly but some leaked from the cubes. The suspension arms of the tandem had lost the warranty long ago and the silenblocks were almost turn to dust. All the plastics and latex elements of the brake system needed urgent servicing. The engine was an OM 402, V8 257 Hp and 12,76 lts., with no turbo. It did the job and get to San Felipe because the Good Lord wanted it and Mercedes did a good job fabricating these things. 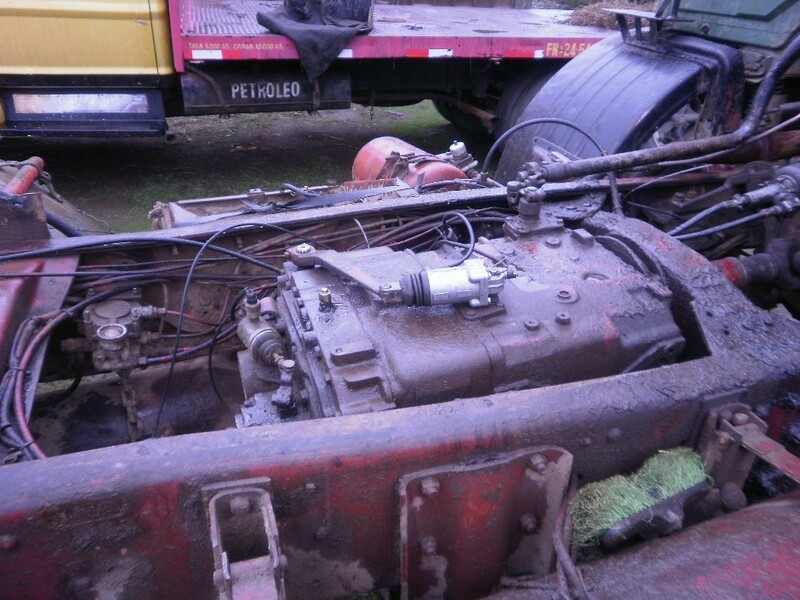 The gear/transfer box was a divorced gigantic one, with eight speeds forward and two aft, with a super-low gear that I hope will take me out of trouble in the near future. The photo shows its massive bulk and the impressive web of tecalan after many years of improvisation. It takes only one look at the rear tandem to see that with such a suspension neither a box nor your kidneys would stand a cross-country trip, not even a short one. The photo shooting took place under a very gentle afternoon rain shower, and I put the Terrano after the truck to start planning about the future trailer for her. 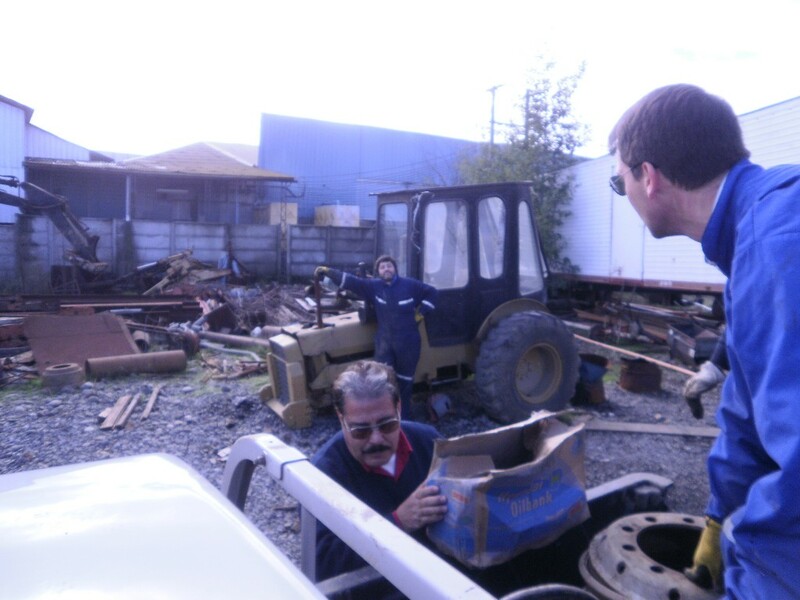 Later on Eduardo took the truck for a short mudding essay to check again, and for pure fun, the blockers. 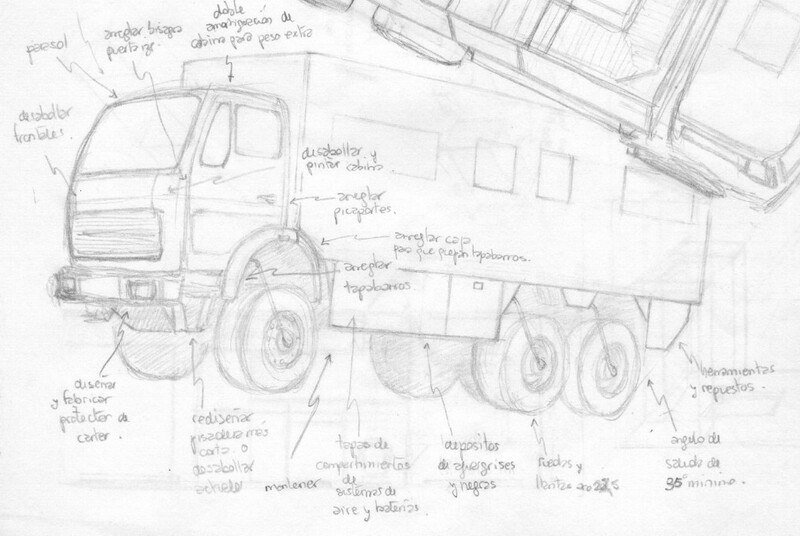 The hurried sketch represents, summarily but incompletely, what this venerable truck needed to be done to transform it into the wanted Merkabah. your idea to increase the volume of compressed air wouldn't be allowed in Germany as far as I know. You are modifying the brake system (essential) part and the time to re-fill the system should be done in a certain time frame. By increasing the volume this time is increased. NOTE: I have read this in a forum, I am not the expert to say if it is really applicable for Germany. And for your country I definetely don't know it at all!! In your post from 04.05.2011 is a slugline between two pics missing - therefore we need to scroll to left and right for every longer sentence, not very conveniant. Please try to edit! Thx. my enlish is not so perfekt and I heavn't read all the Story of your dream, but I'll send all my respekt to you! There is many working in front of you! 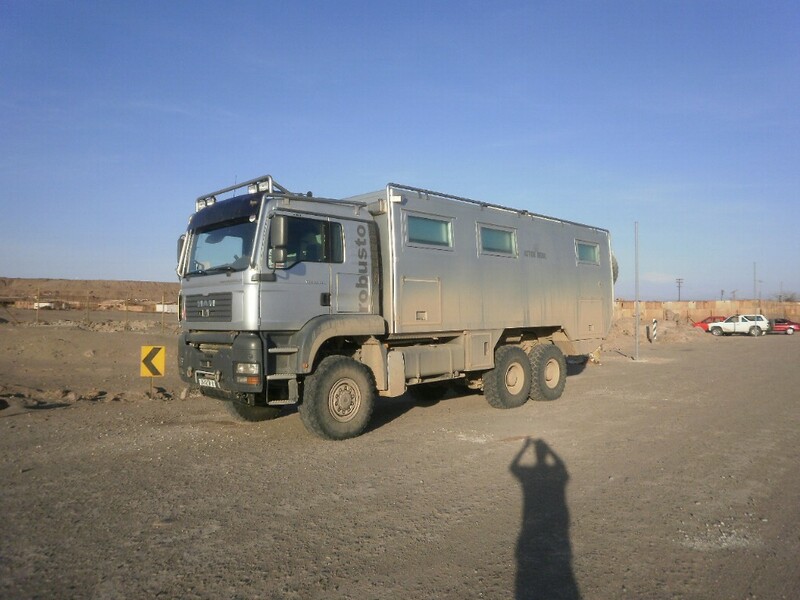 But I thing you have a good base for a traveltruck! In some drawings there are such Wheel-Air-Filling-Systems. 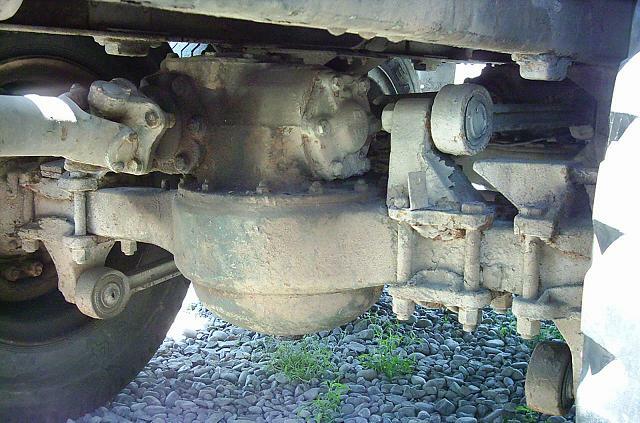 In Southamerica it's "normal" to have such systems in trucks or overlandcoaches especielly in Brazil... Can you tell me what's the cost of such systems for a 4 wheel / 2 axle base truck??? I think there are some other memebers in the forum who are interestred of this! The brake system itself will not be touched at all; the air filling circuit is secuentially charged, and the primary brake circuit is the one that gets charged first. Once this is accomplished the rest of the tanks begin to get filled at a higher pressure. At present the clutch is air-dependent and it is very boring to be sitting there waiting for it to be ready even when the maxis are loose. You are absolutely right: scrolling back and forth is not only inconvenient, it is quiet annoying! It was a mistake that I did realize only after submiting the post. Hope not to do that again. Your english is way better than my german. There are many systems indeed, and its use is growing faster. You can buy the kit or you can get the truck or trailer to the dealer for them to install it. I do not want to put anything too much sofisticated and electronic dependent so I will put the essential components and the air management will be manual driven. Many thanks for your comments. I will continue with the story at some moment later.